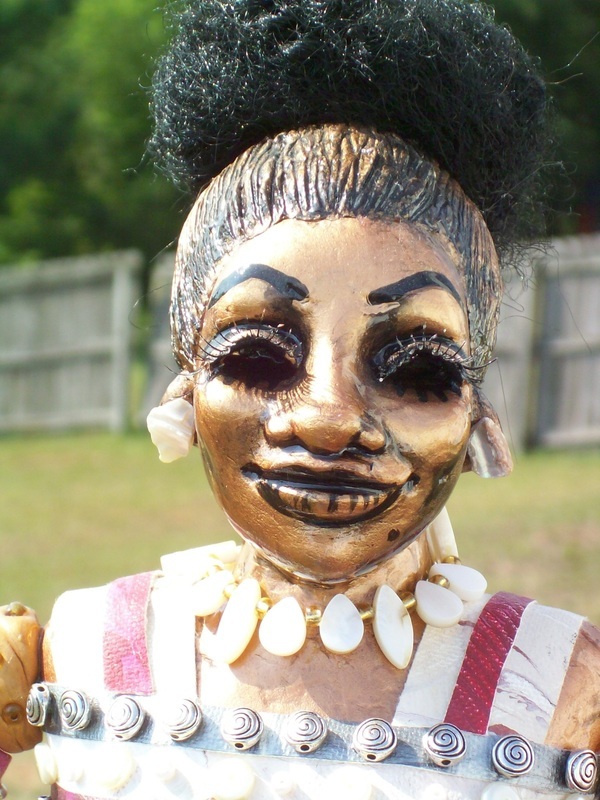 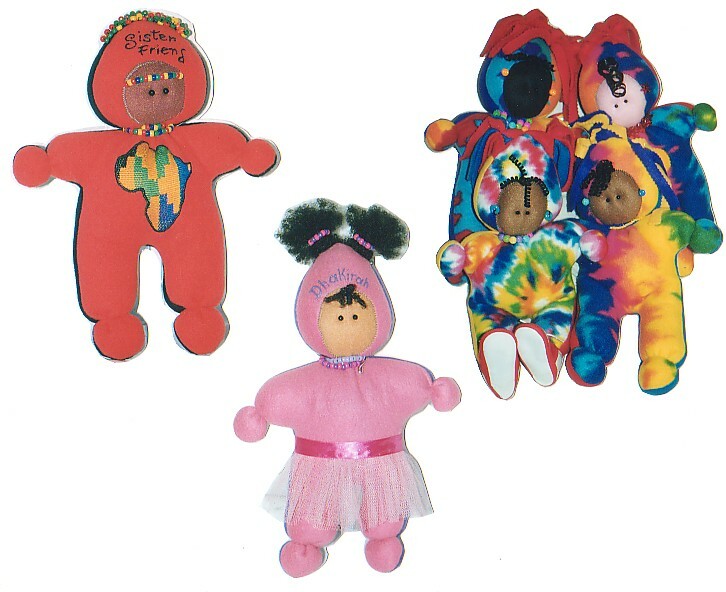 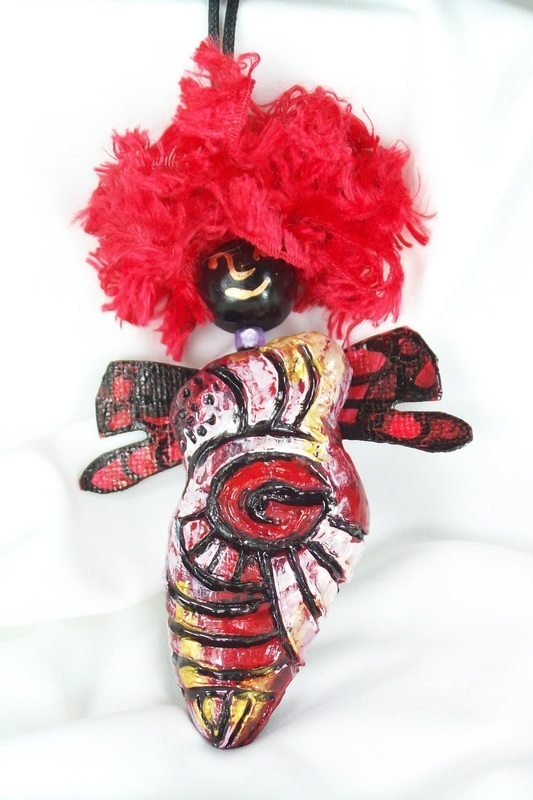 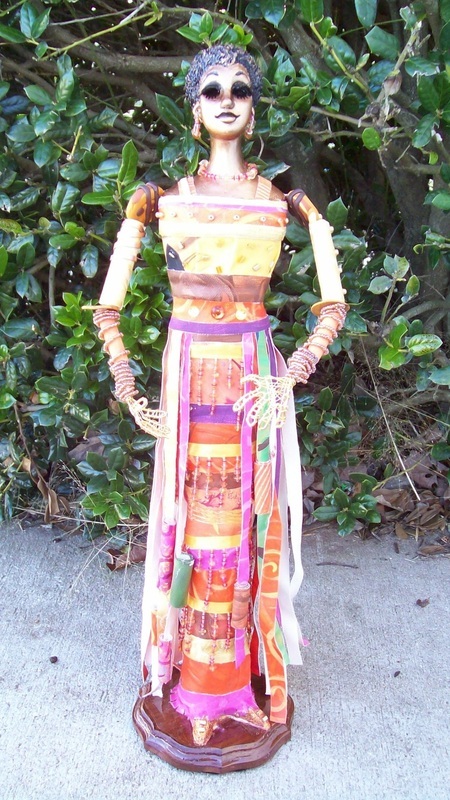 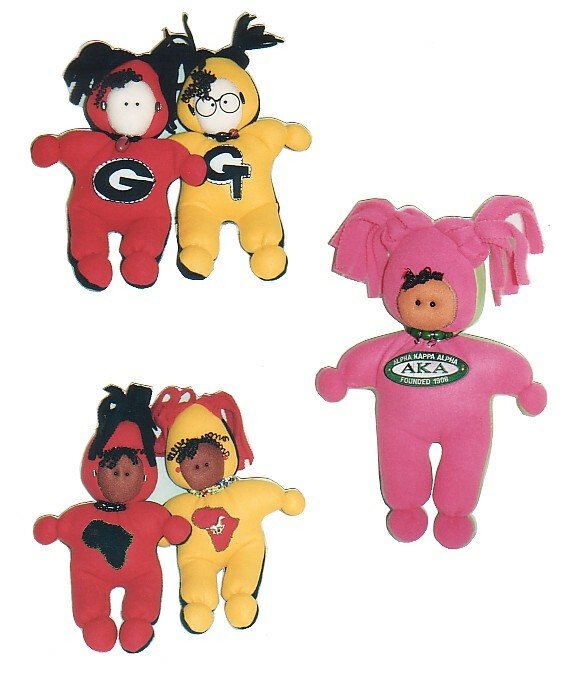 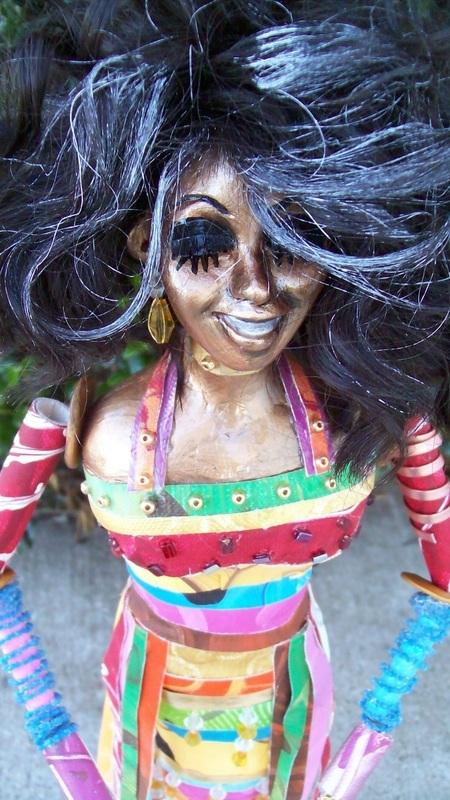 I've been creating dolls since I was 7 years old when I checked out my first 'how-to' book on doll making from Wynnton Road Elementary School in Columbus, Georgia. 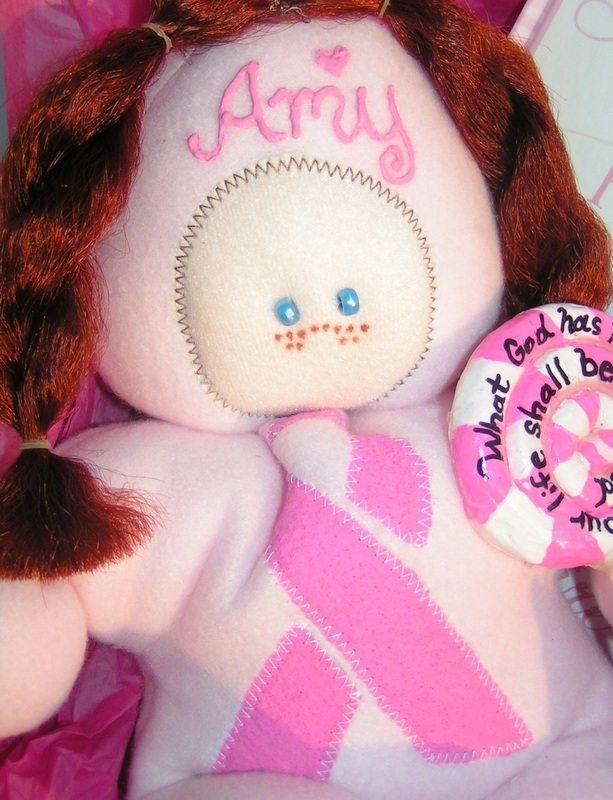 I loved dolls...still do. Today, I just happen to enjoy making them more than I enjoyed playing with them back then. 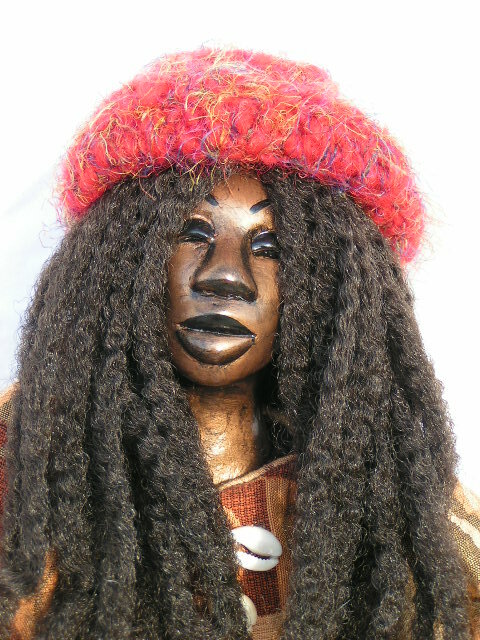 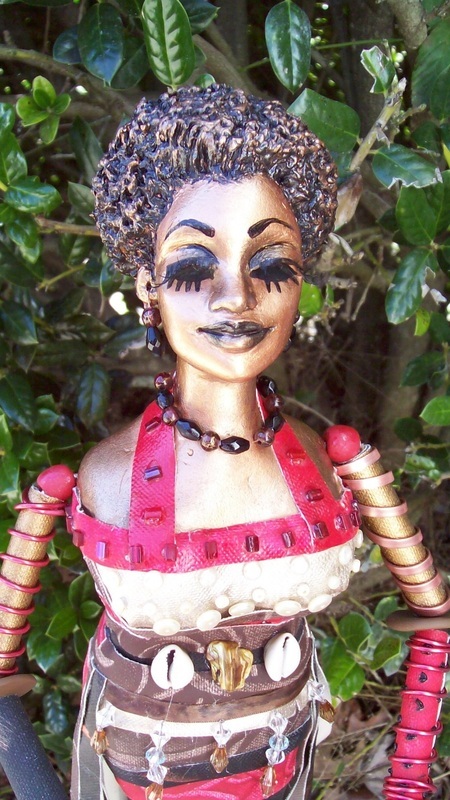 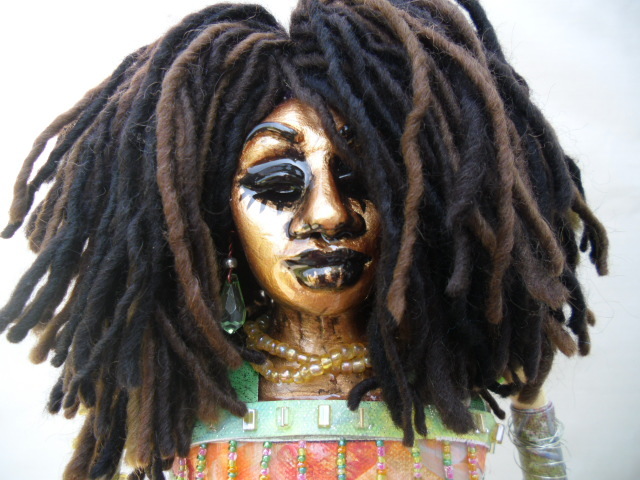 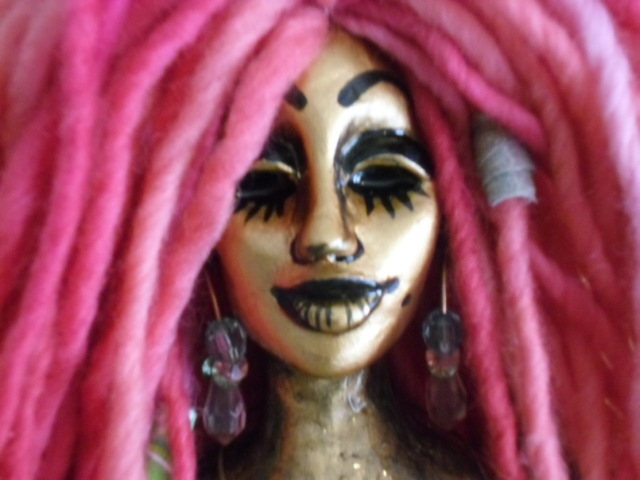 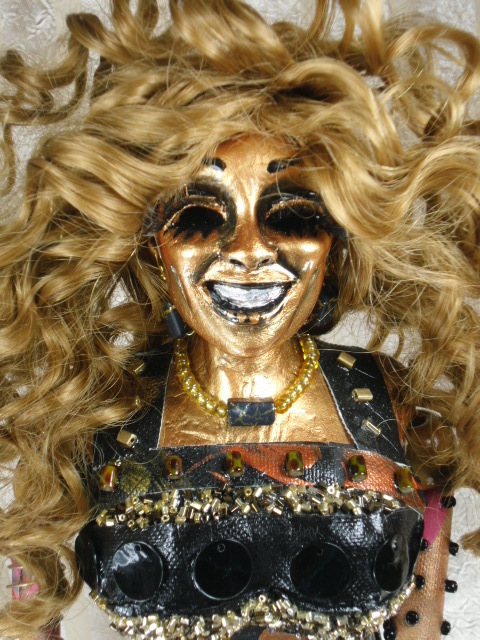 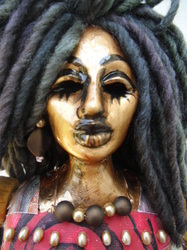 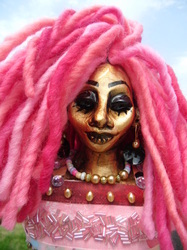 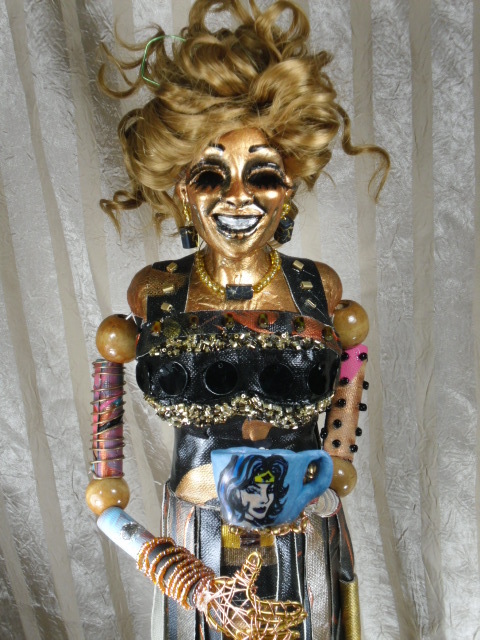 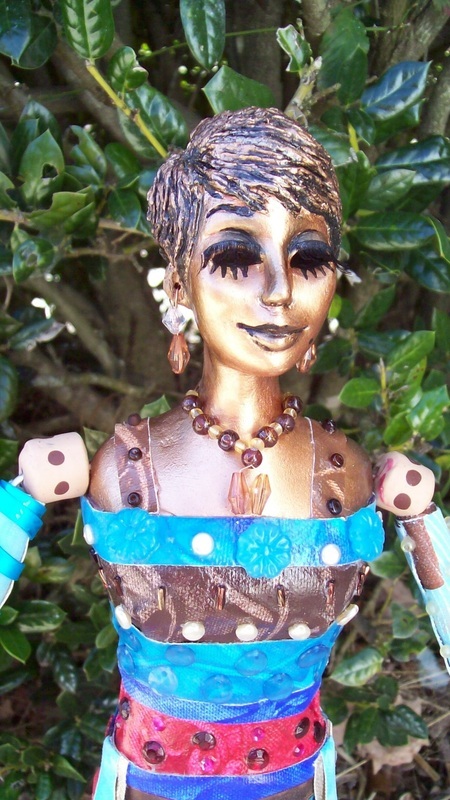 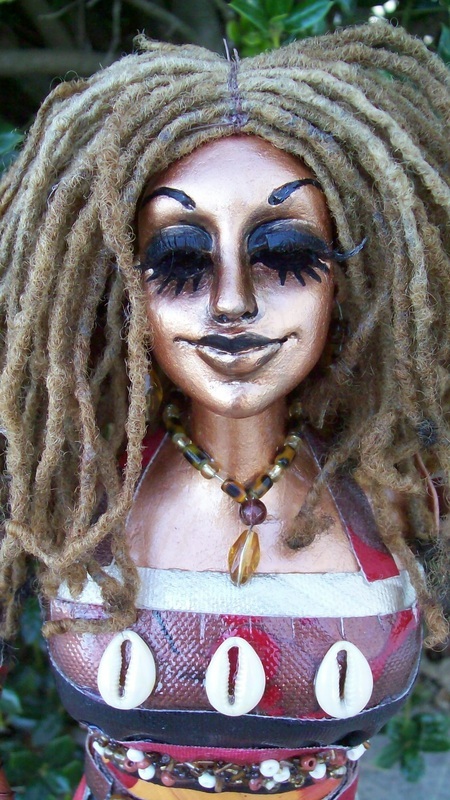 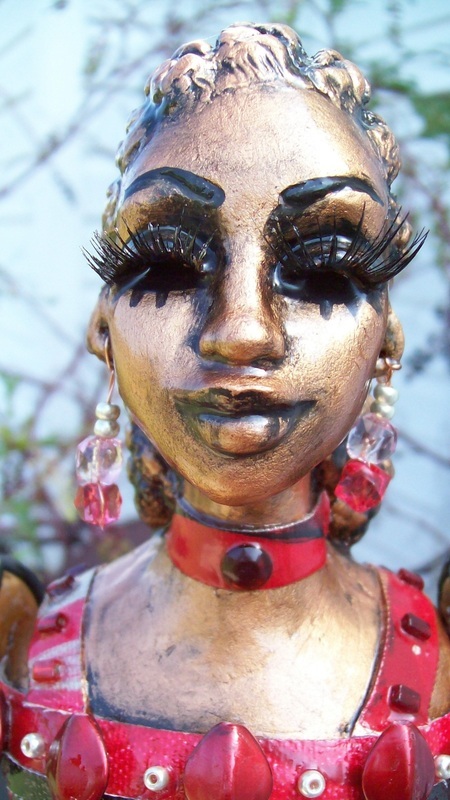 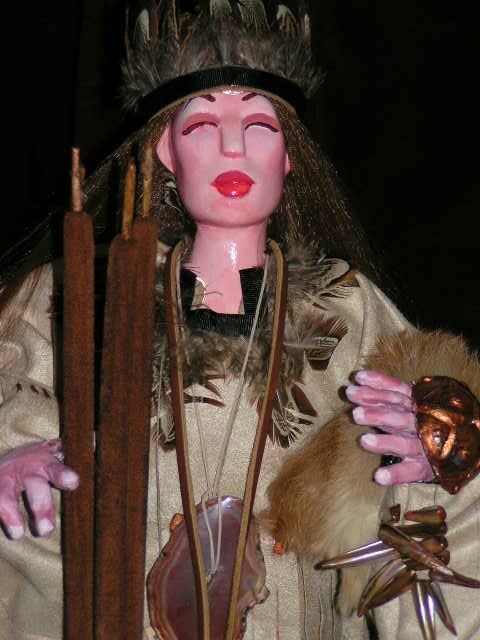 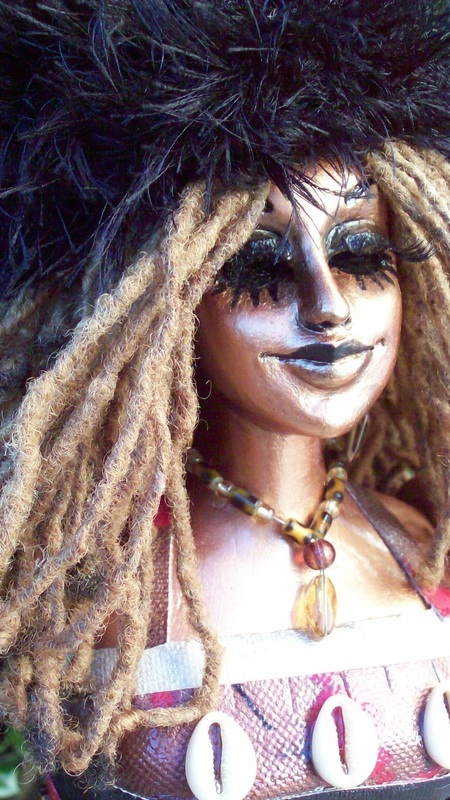 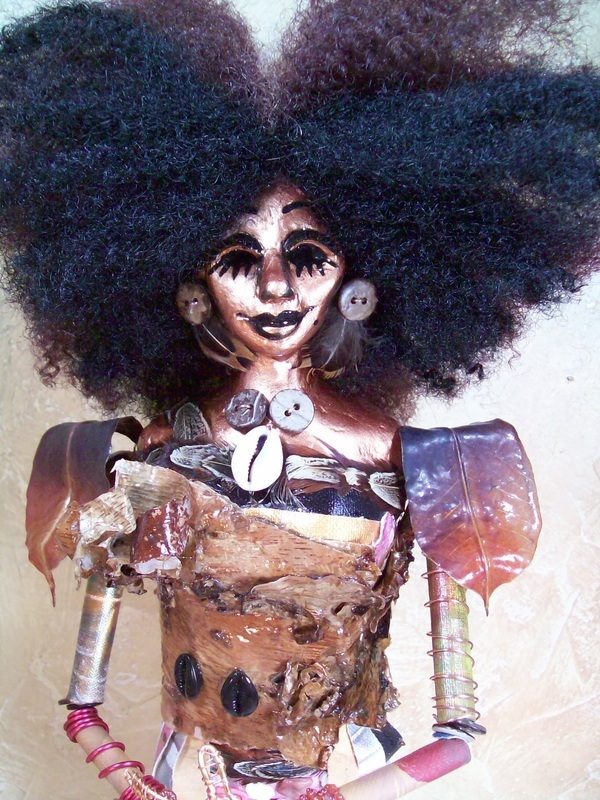 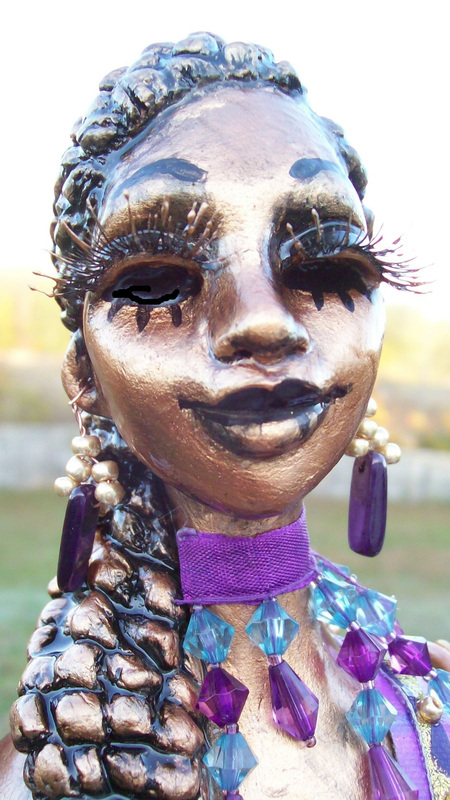 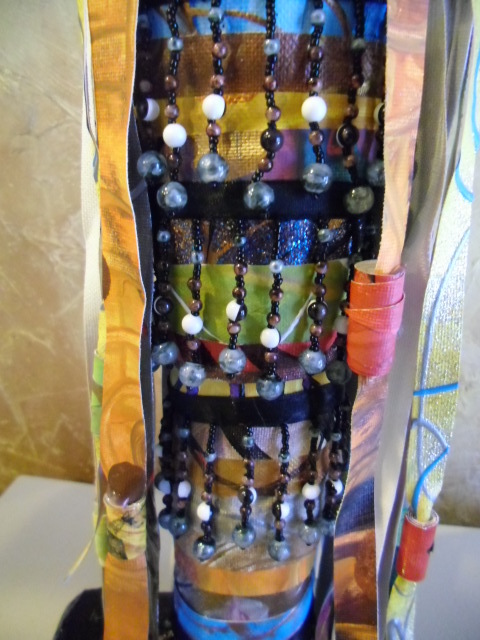 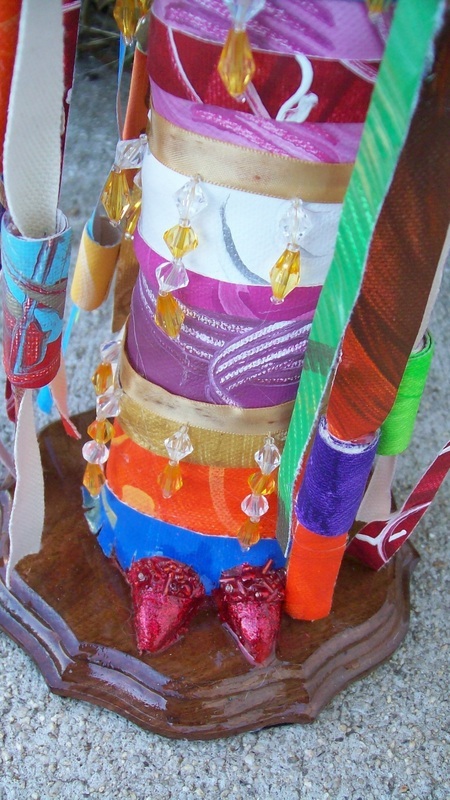 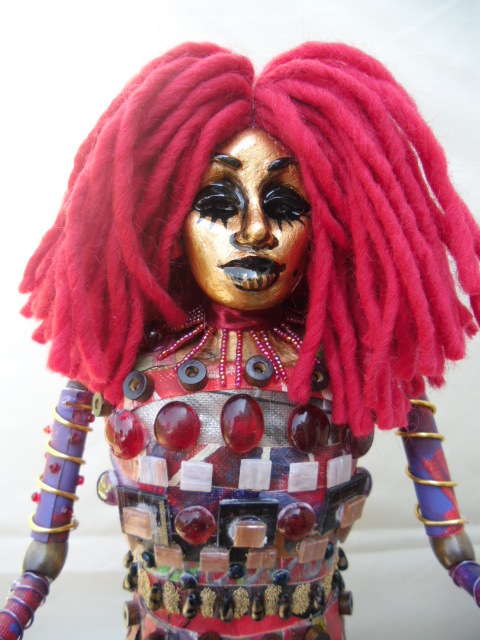 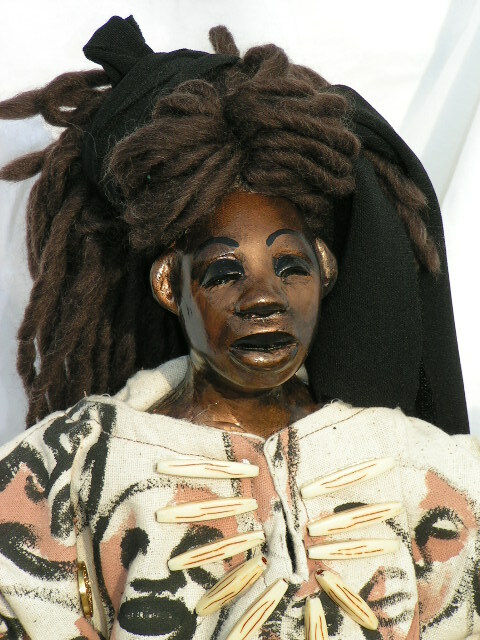 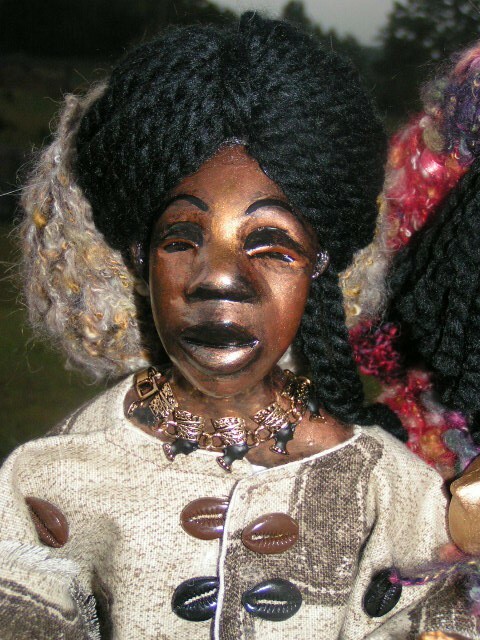 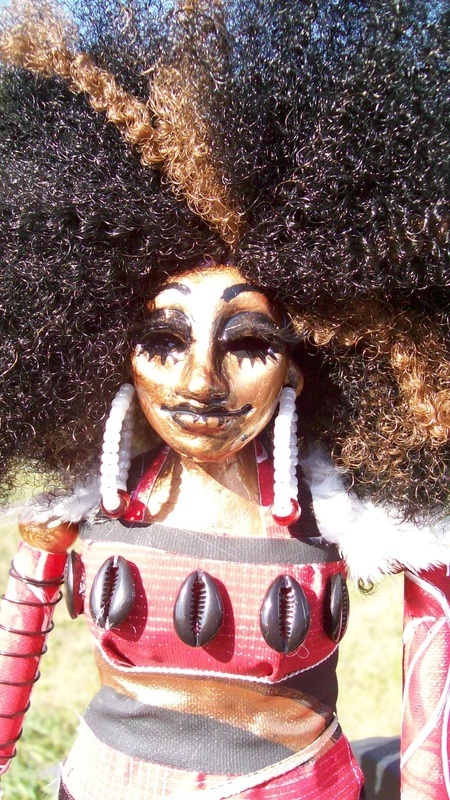 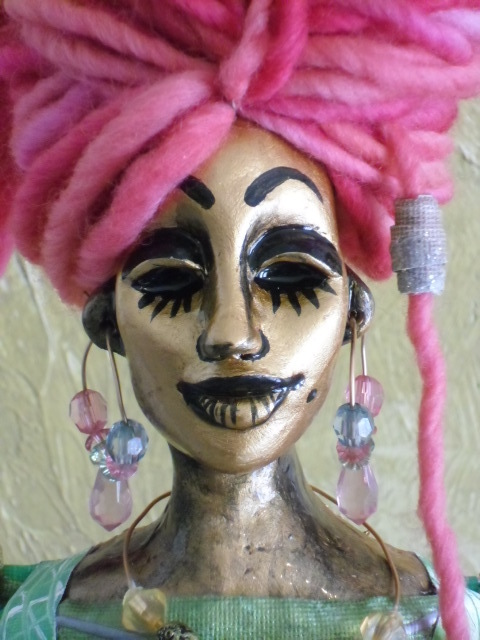 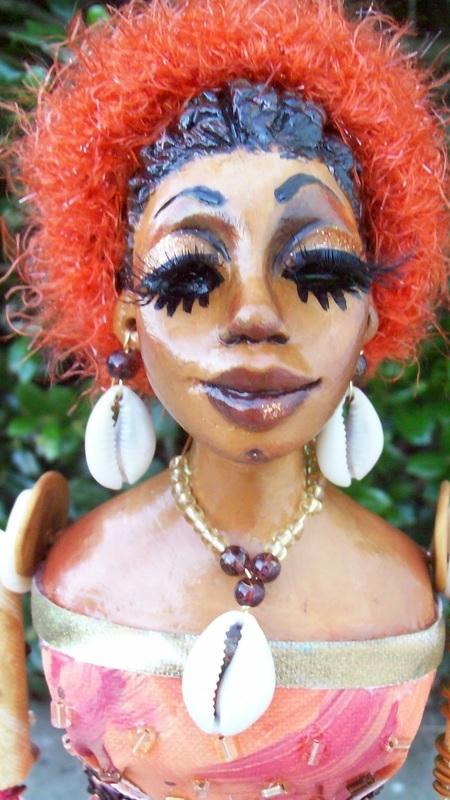 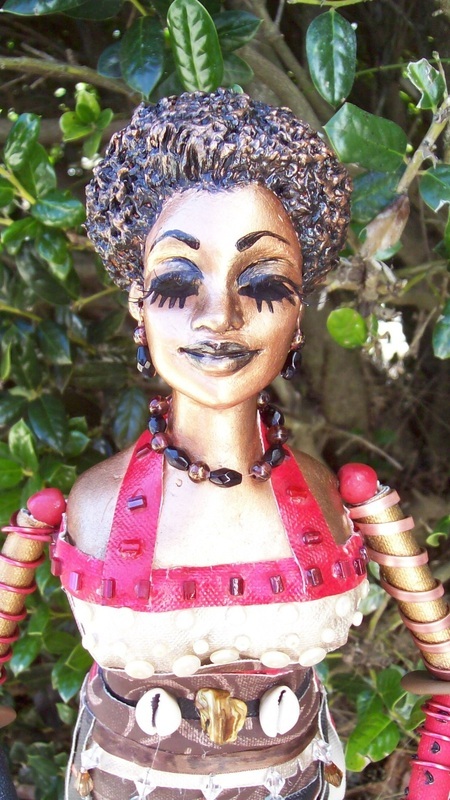 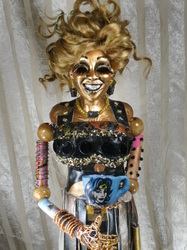 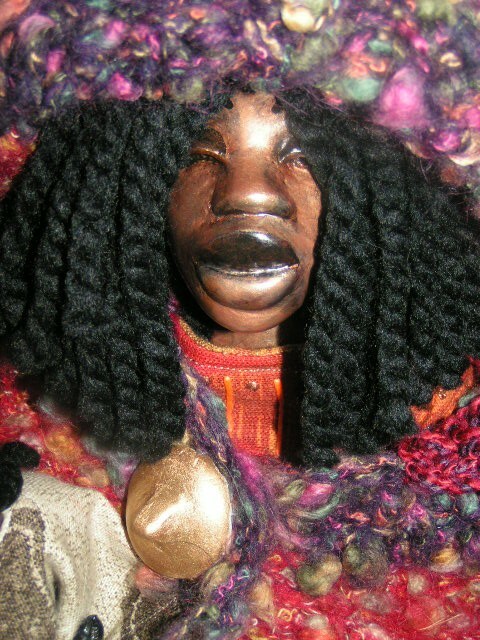 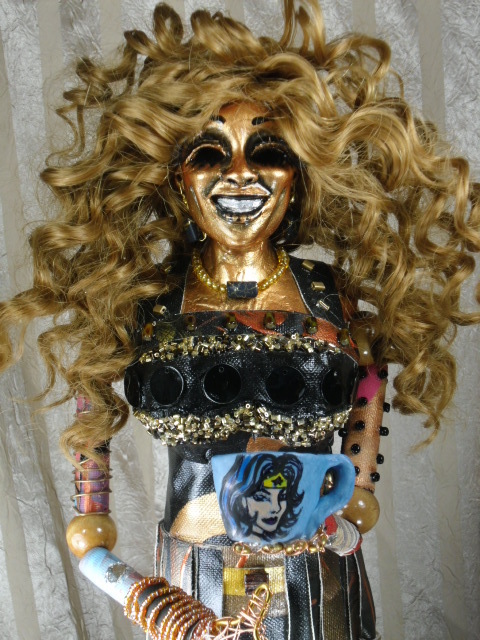 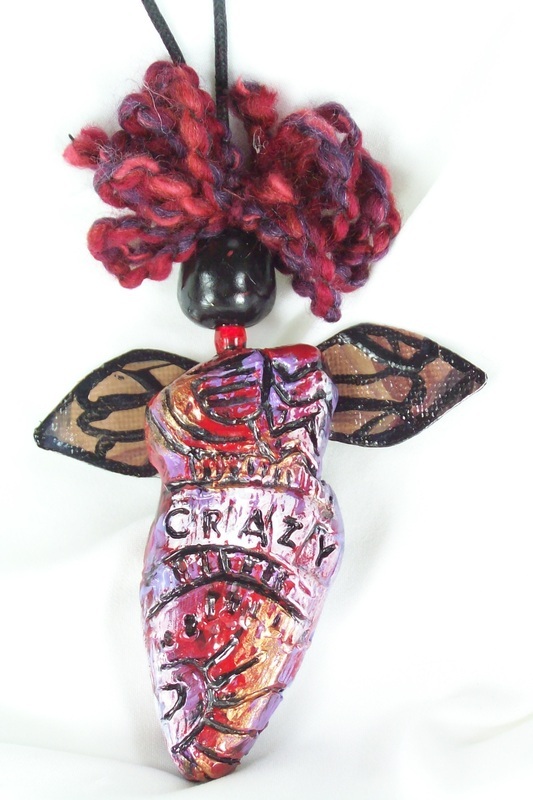 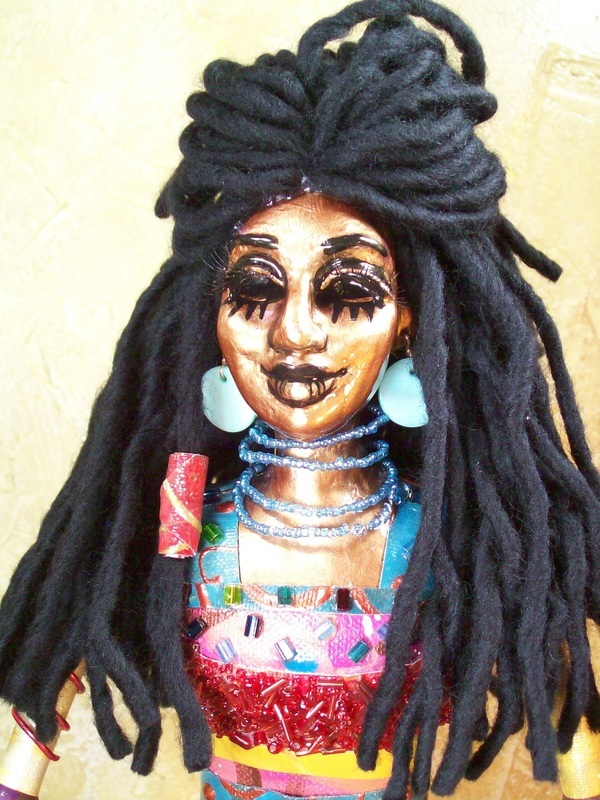 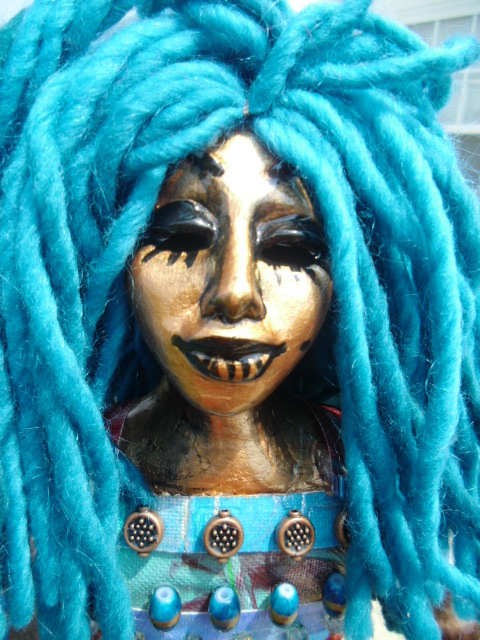 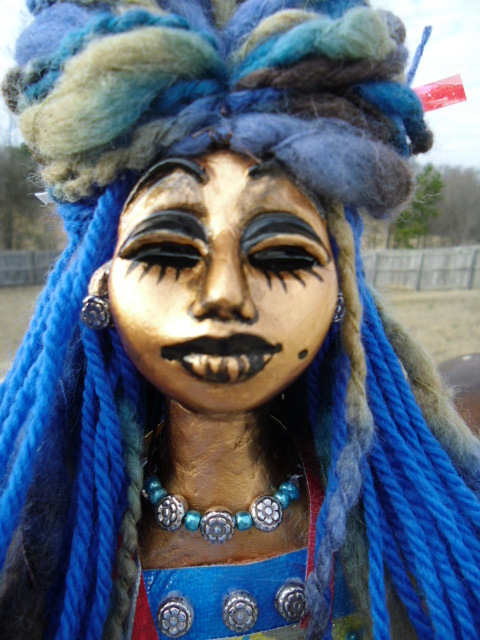 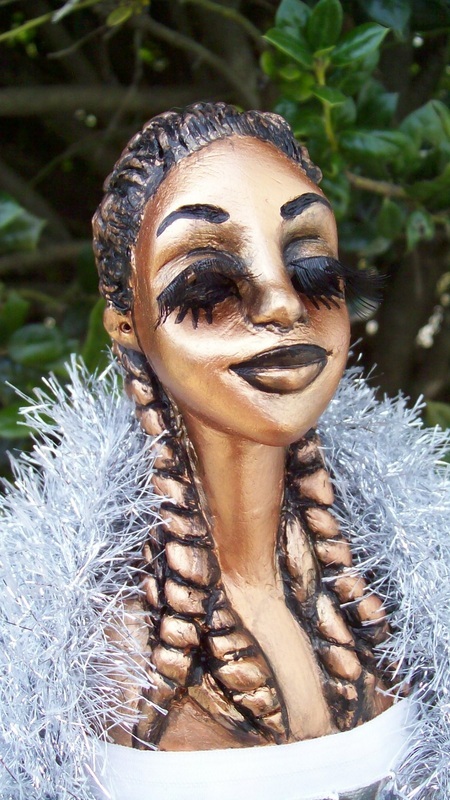 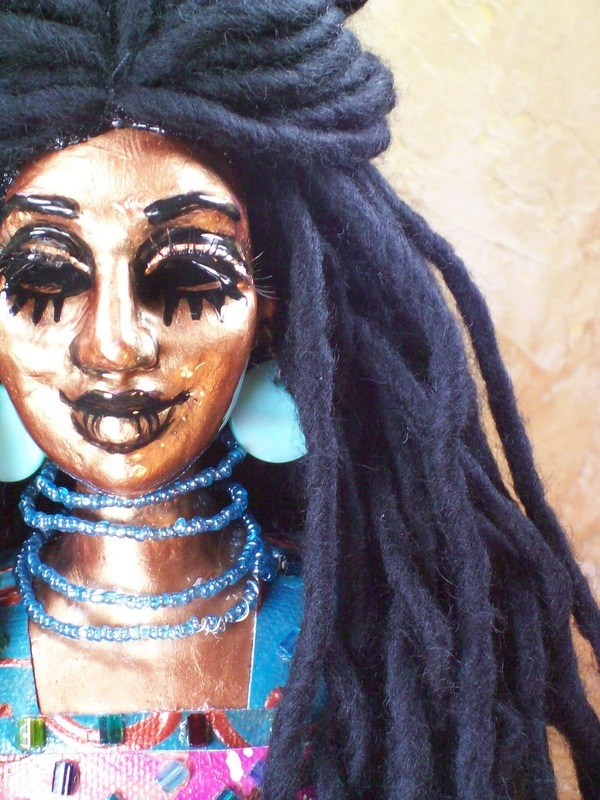 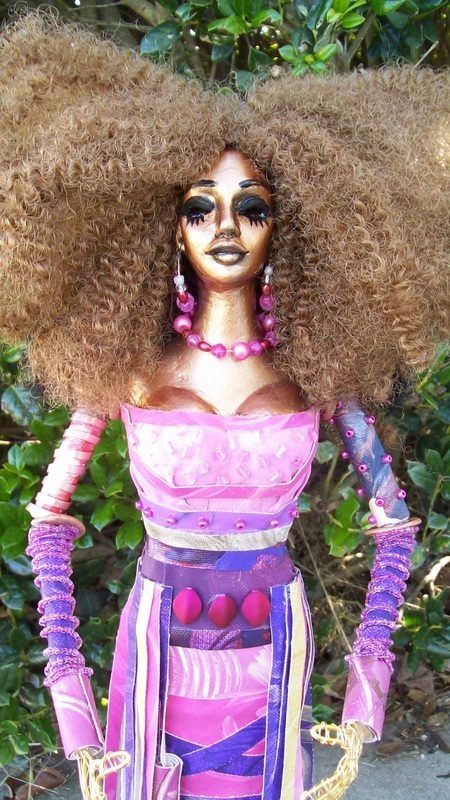 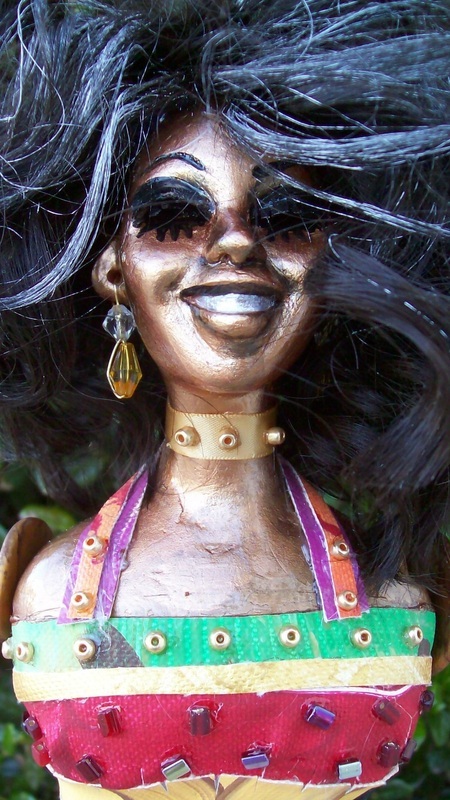 My dolls have transitioned from coat wire armature and stocking creations, to cloth dolls and now to sculptural pieces that mesh together all of my creative skills and explorations which I have labeled "Multimedia figurative sculptures". My different, copyrighted, collections include The Mustardseeds, Black Bears, Lallipops, The Chrysalis Series and SplatterBugz. 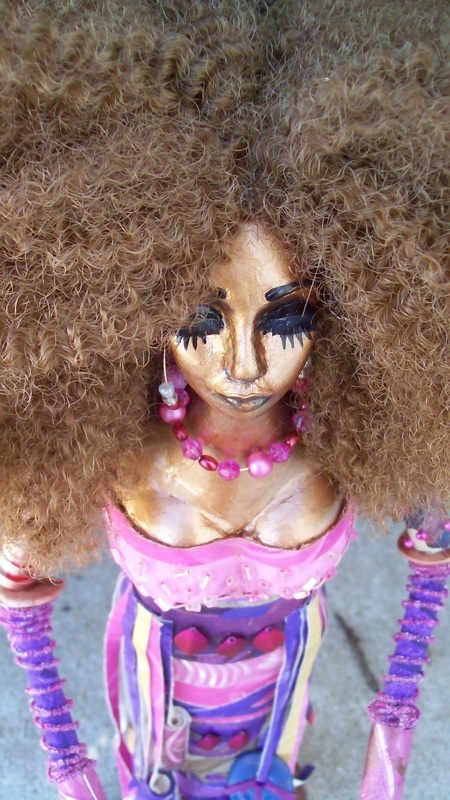 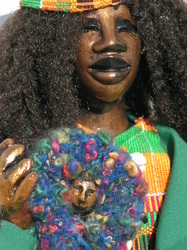 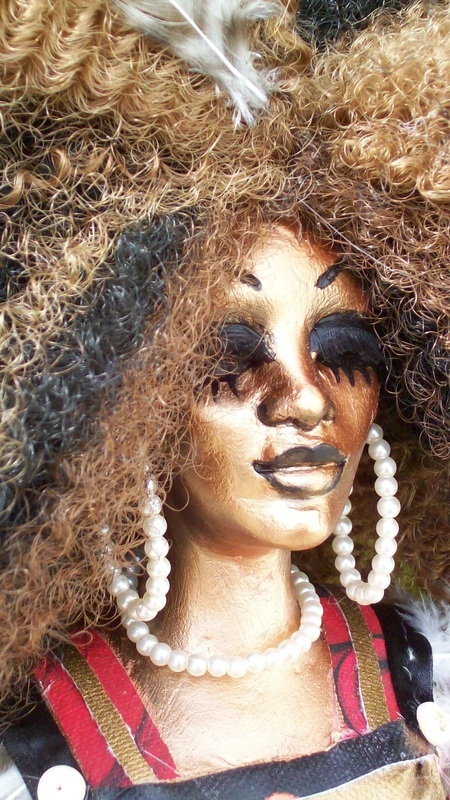 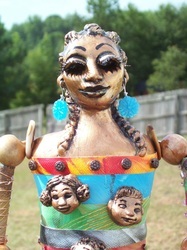 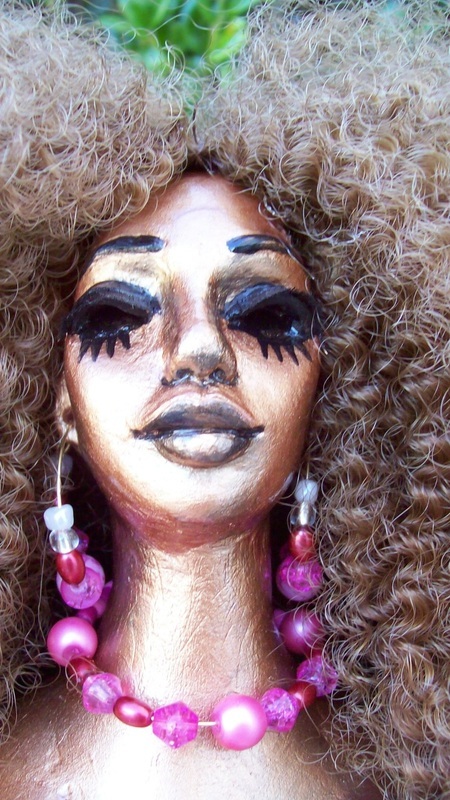 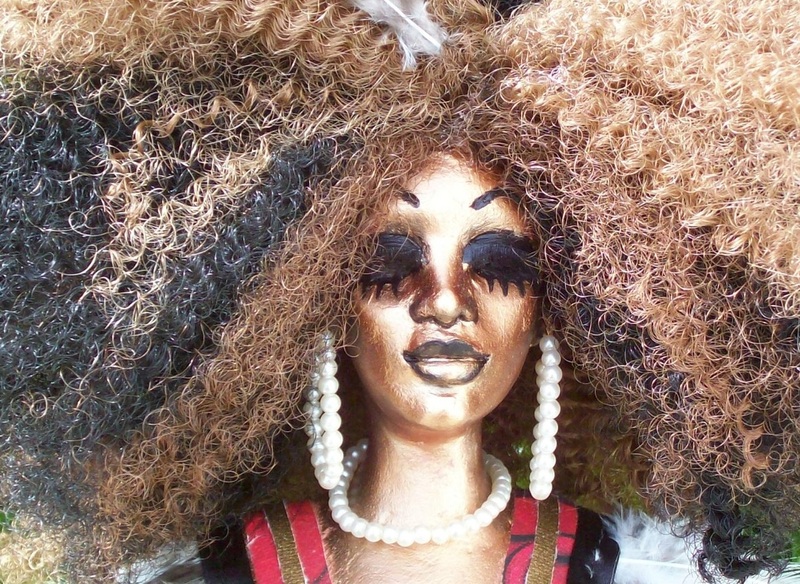 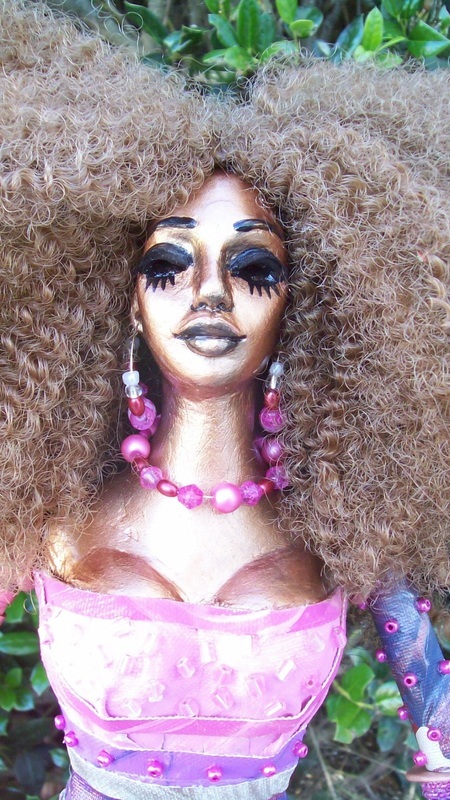 All of my dolls share a common thread and that is to celebrate the uniqueness, beauty and purpose of women! Lallipops were created in 1999 from my own copyrighted pattern. 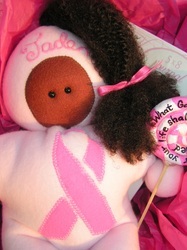 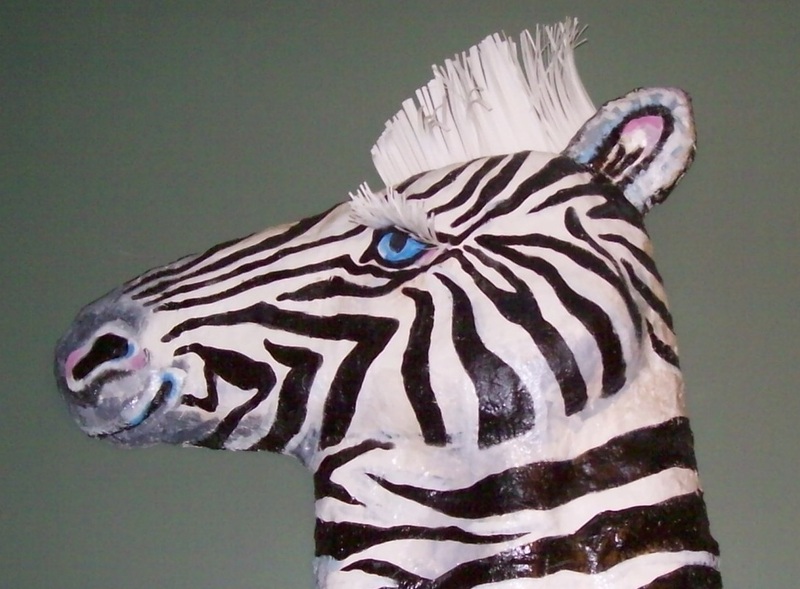 They are unique in that they can be customized to represent anything, anybody and any cause in any color. They come with a certificate of authenticity, a color symbolism chart and a lollipop. 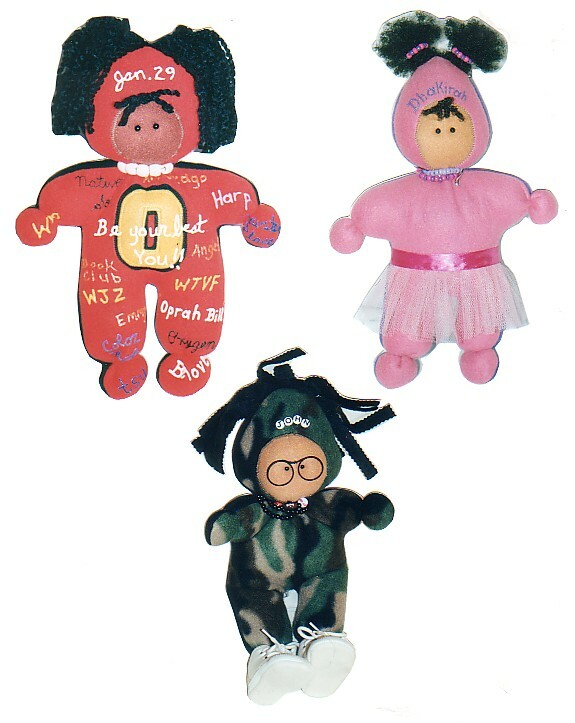 Lallipops that are created for specific groups or 'causes' have a special informational card that accompanies them to describe that group or define that cause. 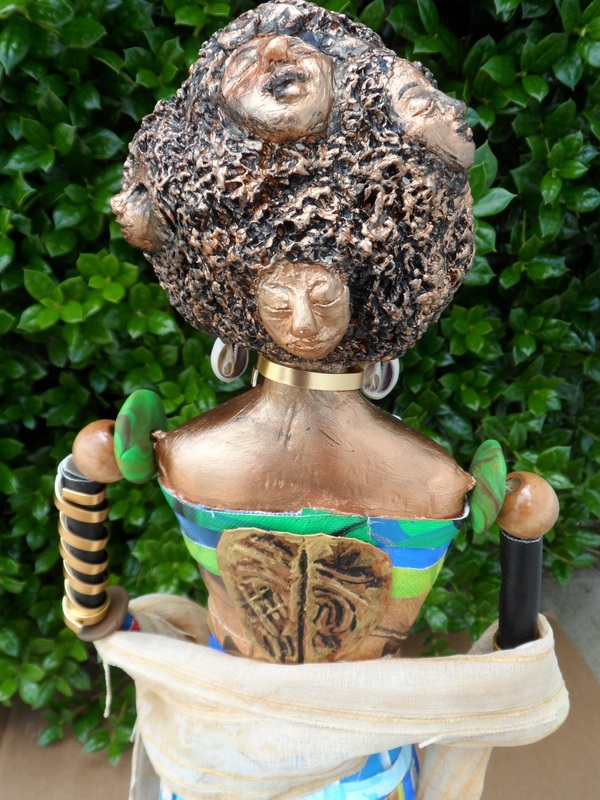 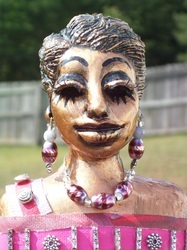 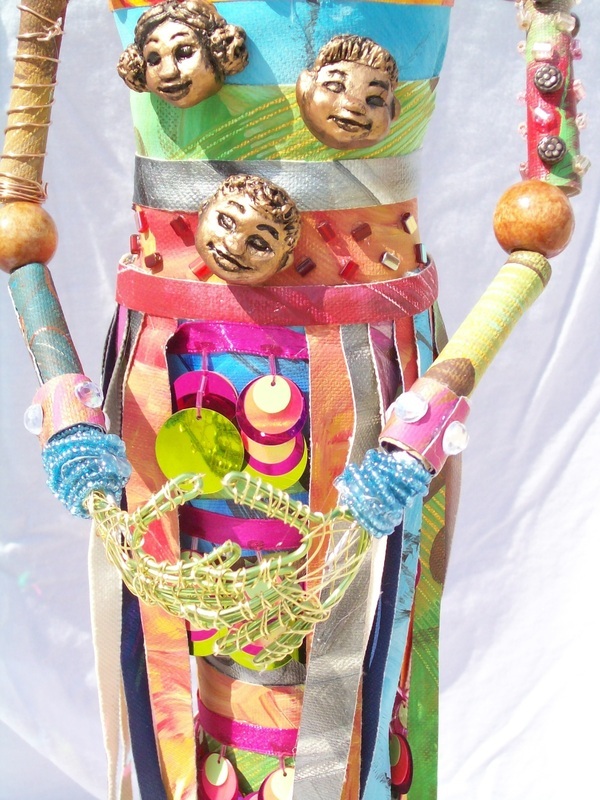 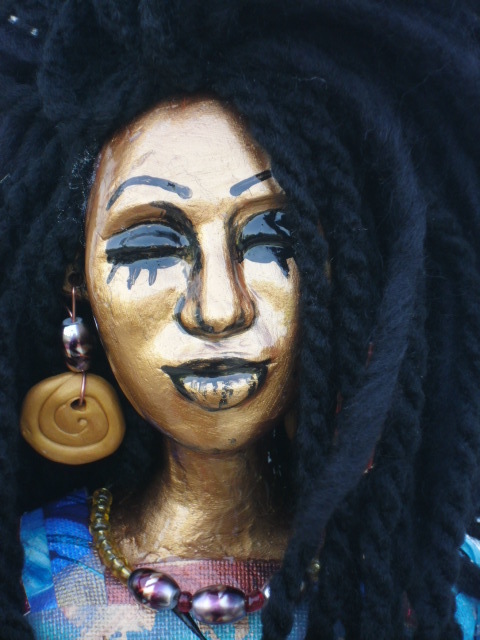 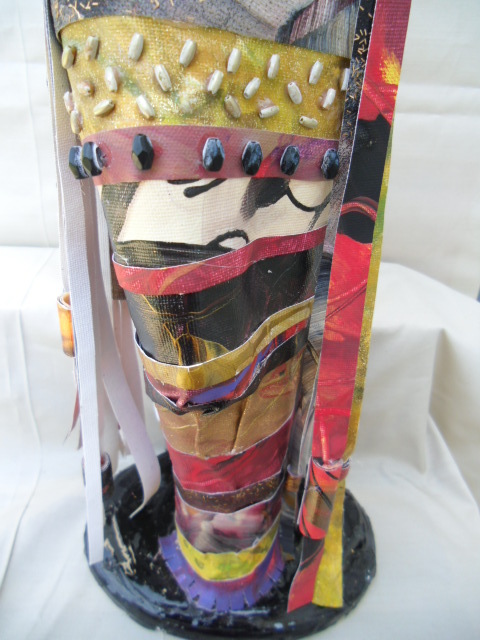 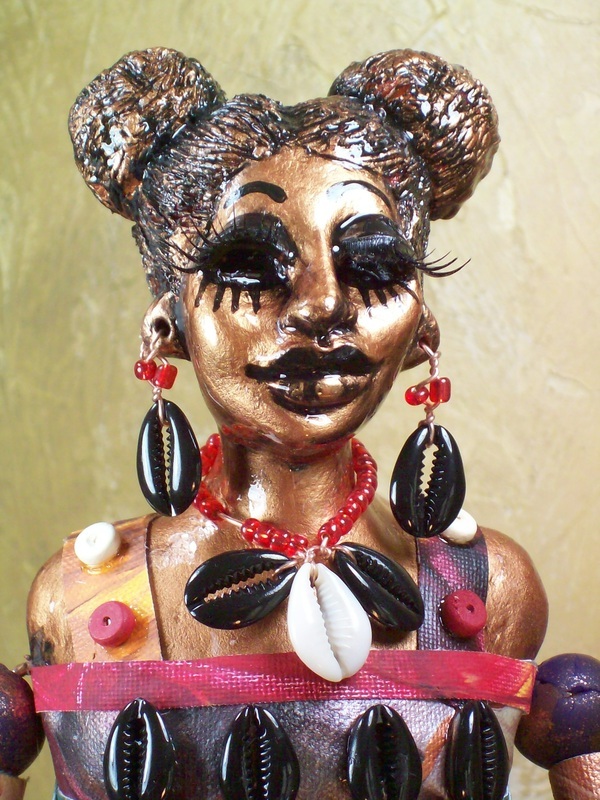 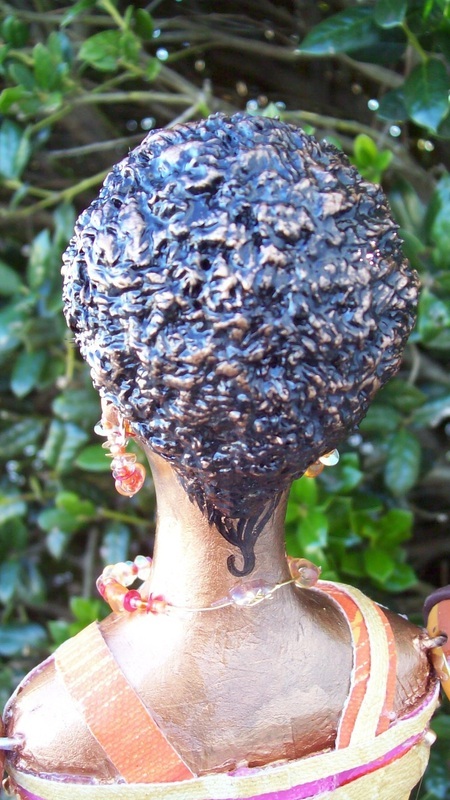 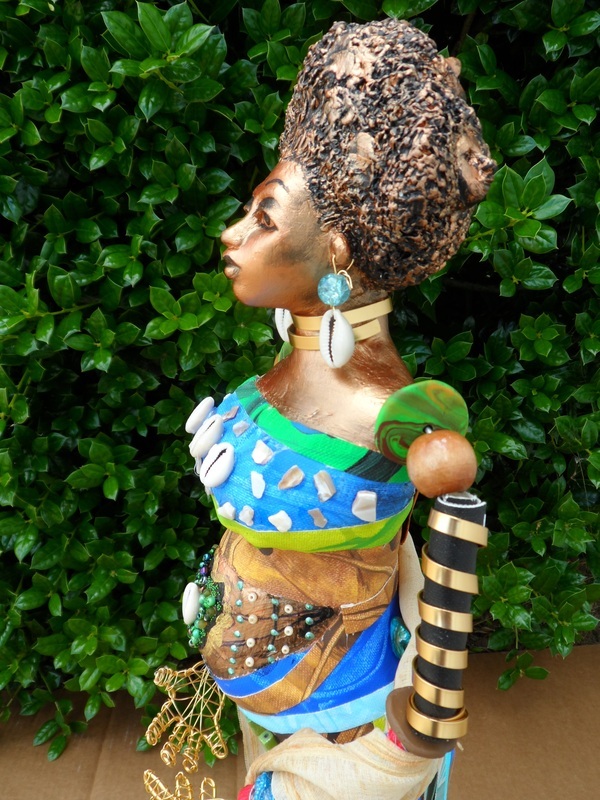 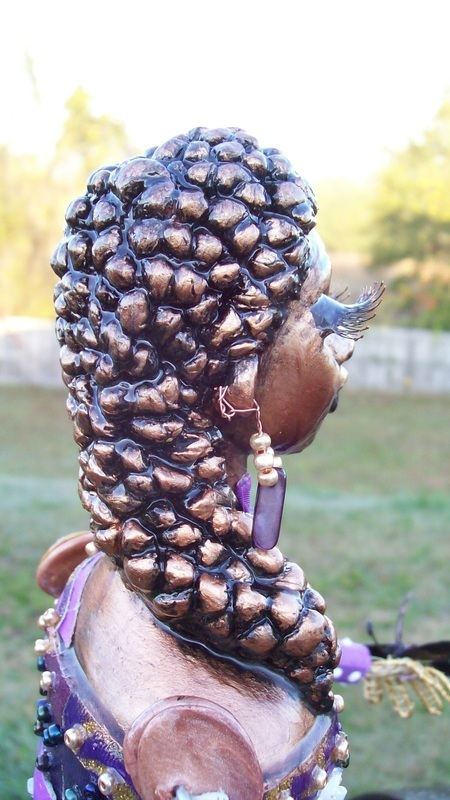 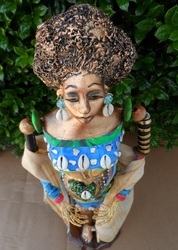 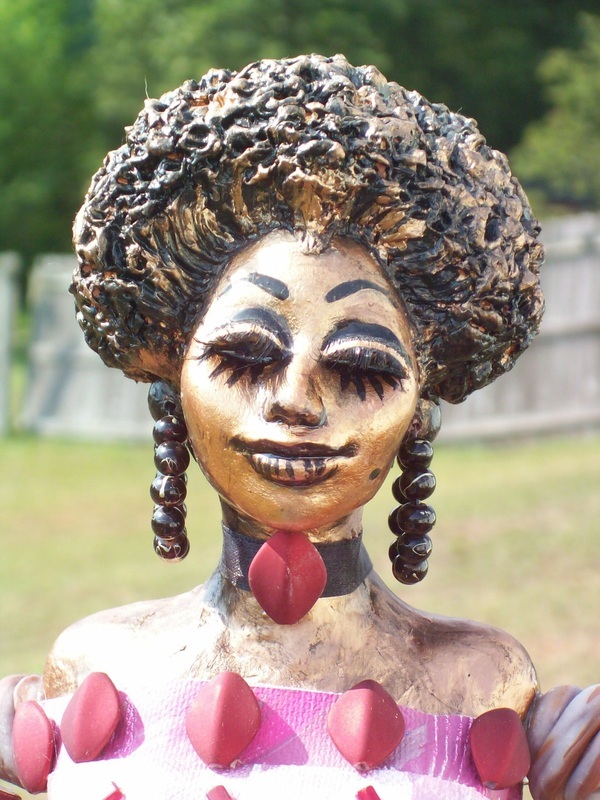 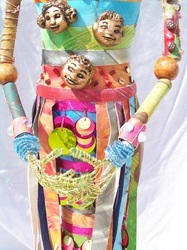 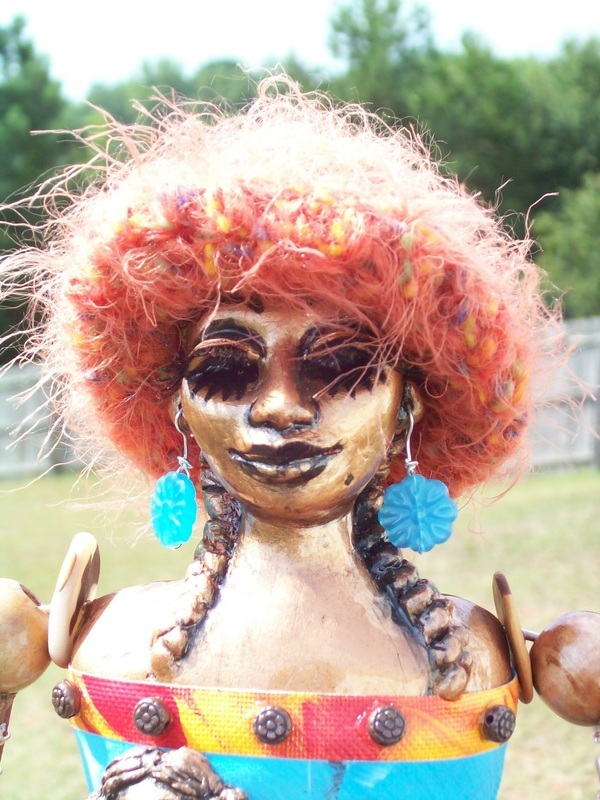 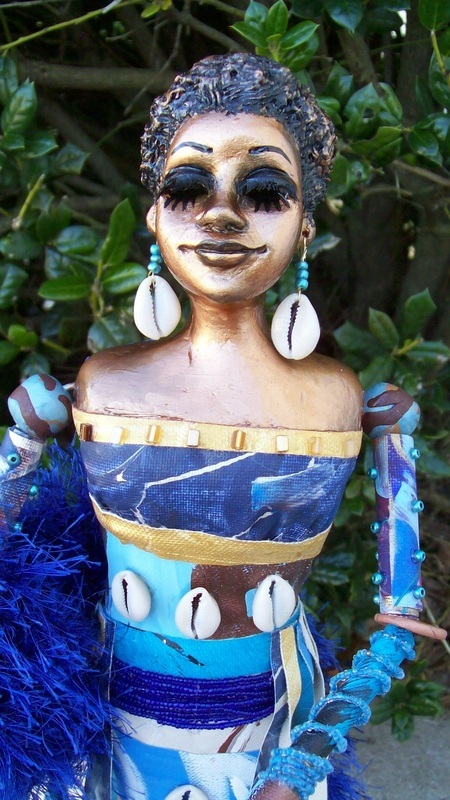 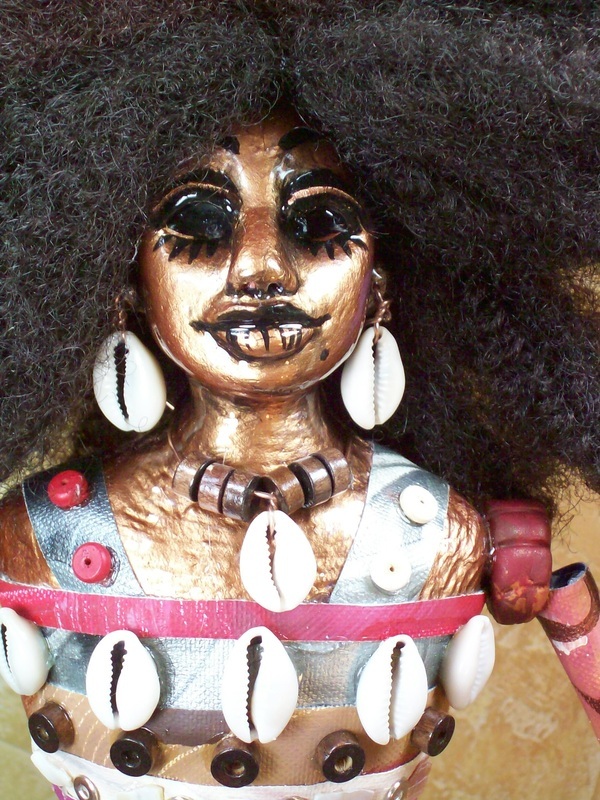 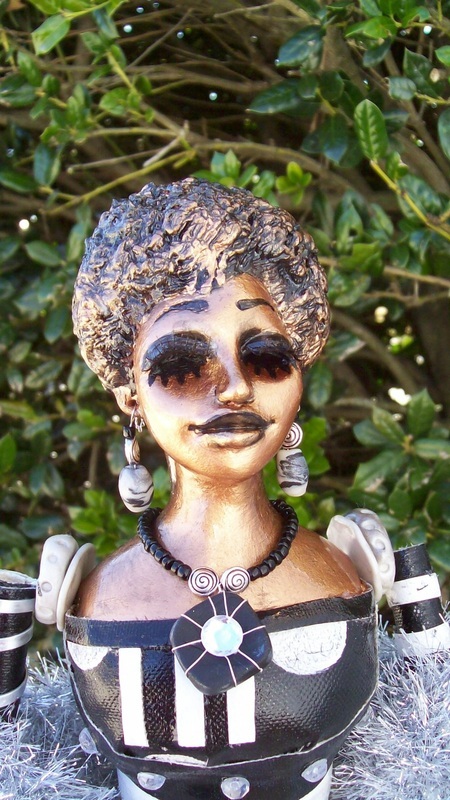 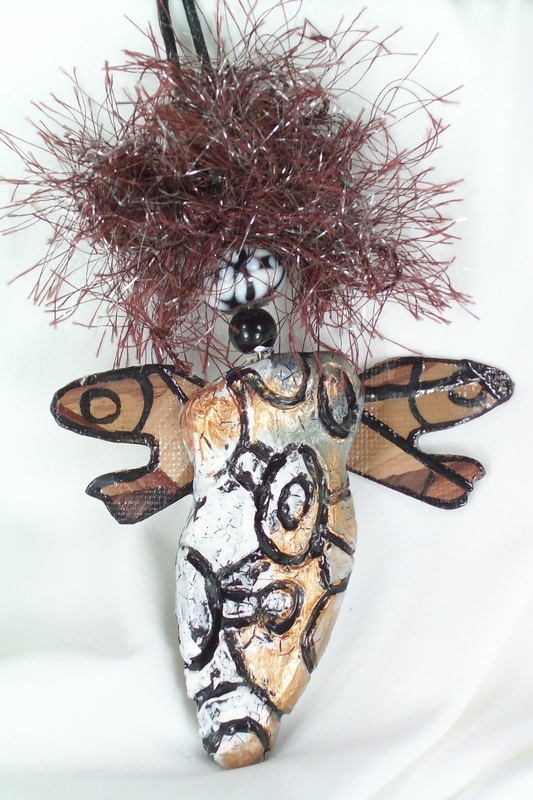 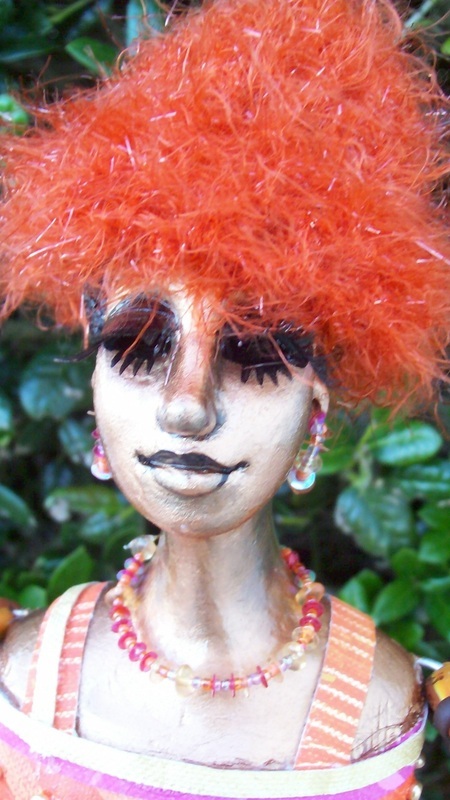 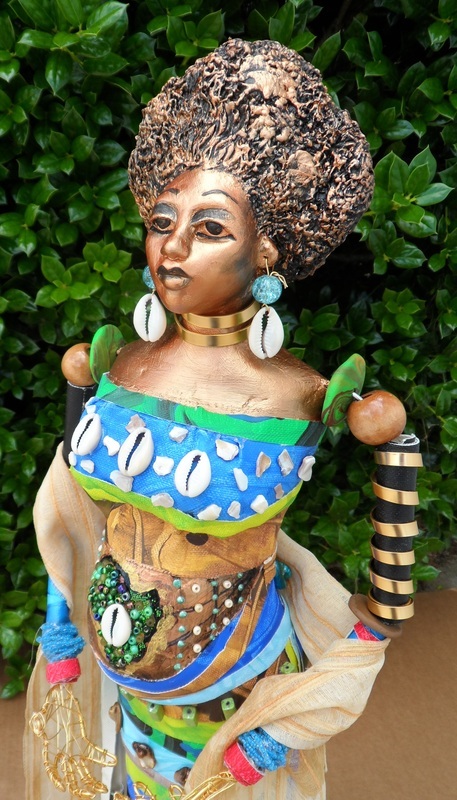 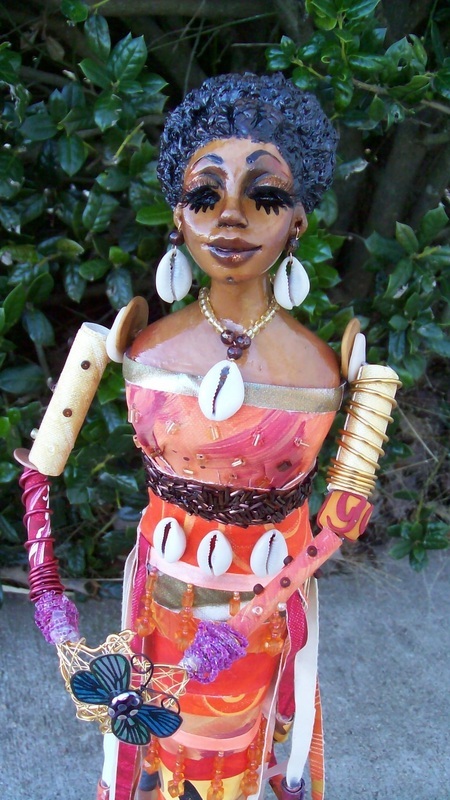 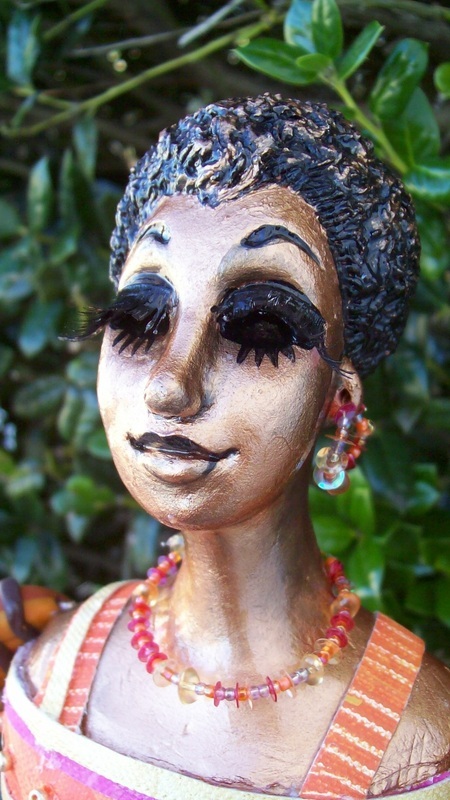 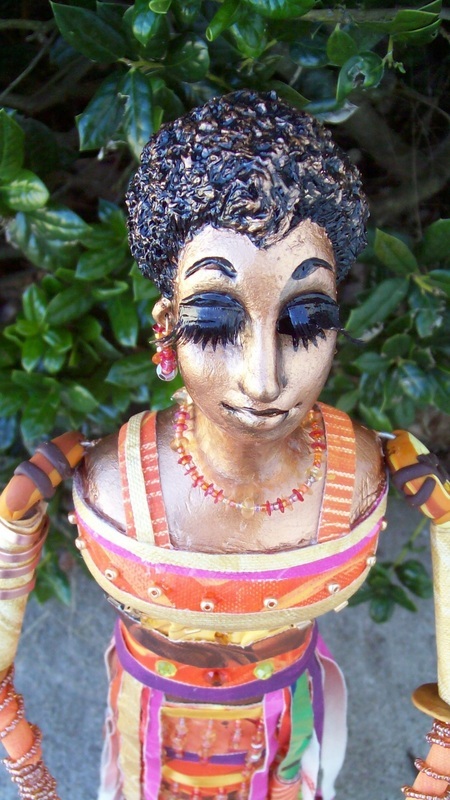 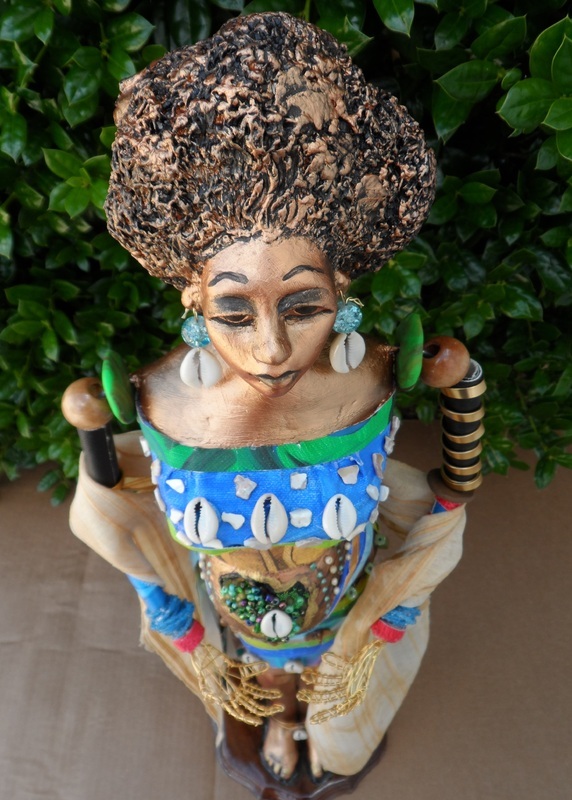 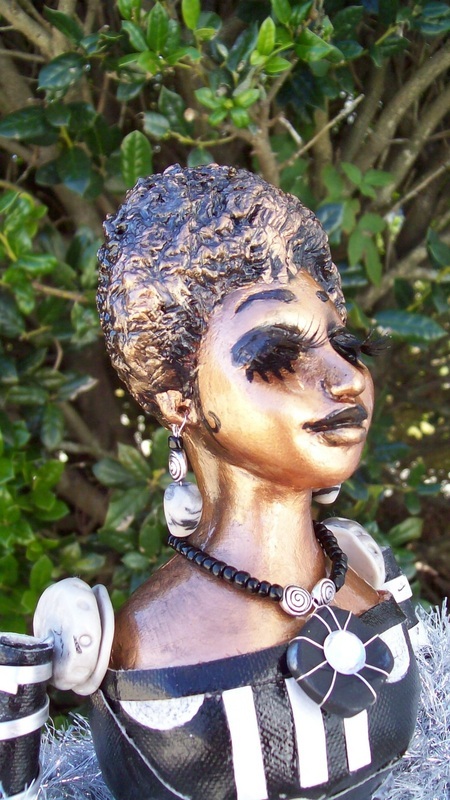 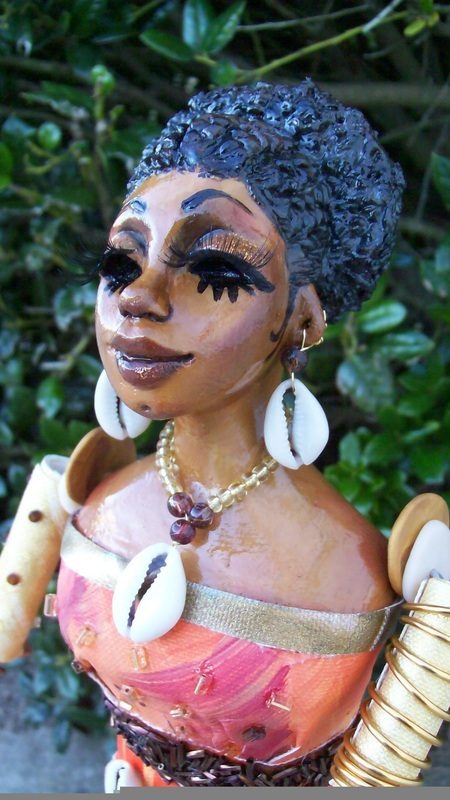 The Chrysalis Figurative Sculpture Series celebrates the woman who embraces life's rhythms. 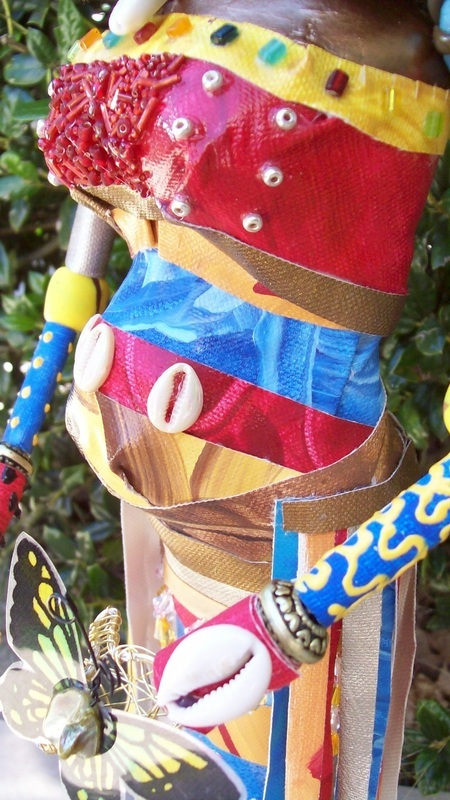 She is dressed in a myriad of patterns and colors that symbolize the textures of her life that have transformed her into the beautiful butterfly she has become. Her hands are sculpted out of a thin wire which symbolize the strength she's exhibited giving birth to and supporting nations and also the gentle touch necessary to nurture a child. 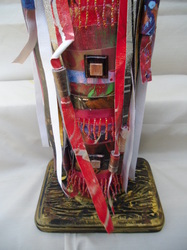 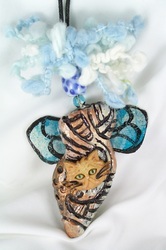 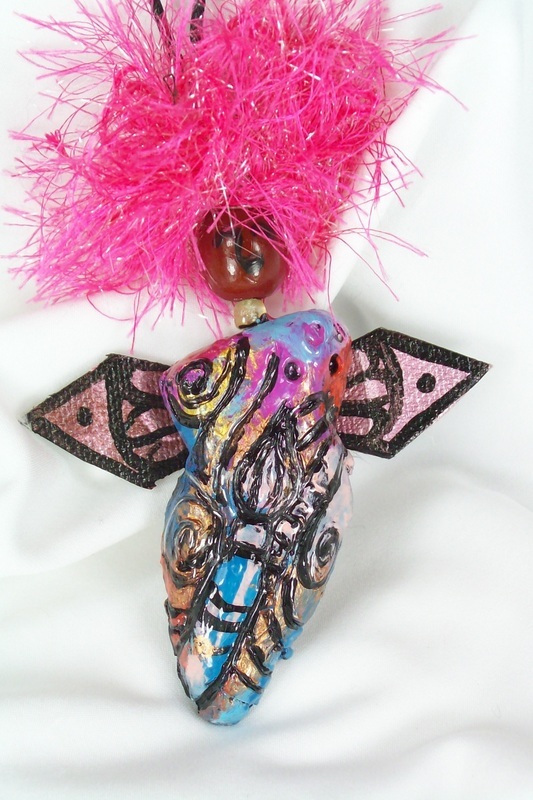 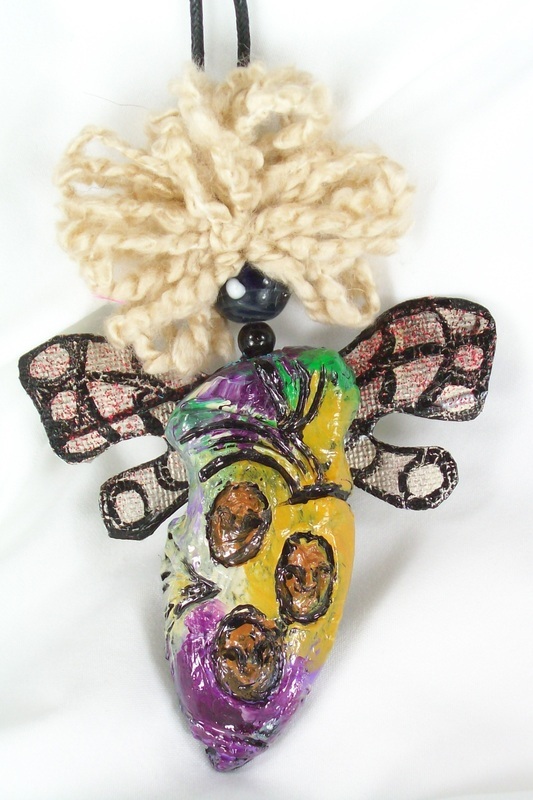 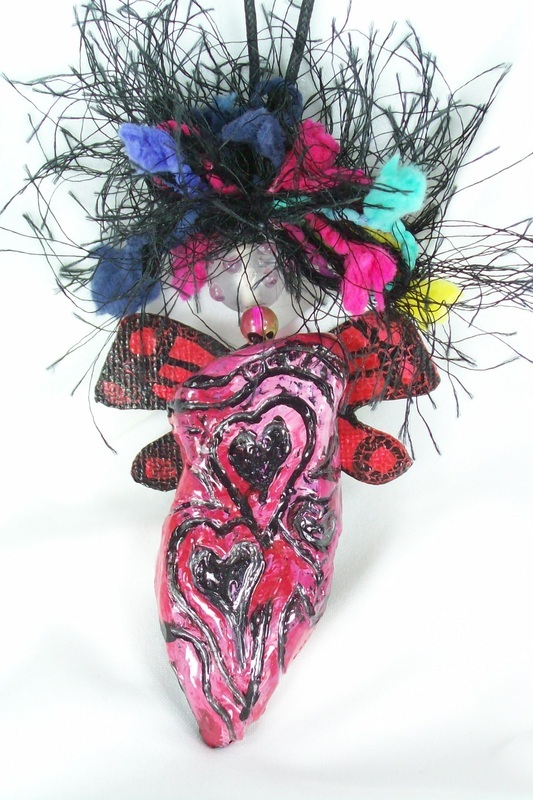 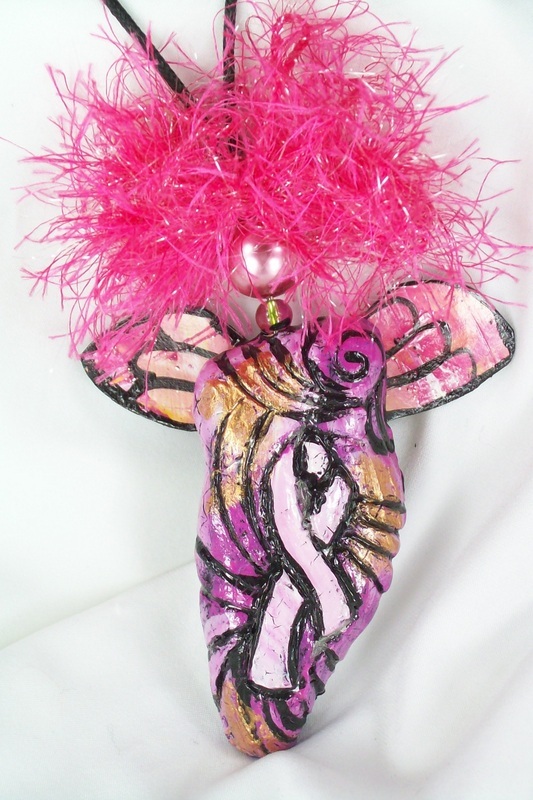 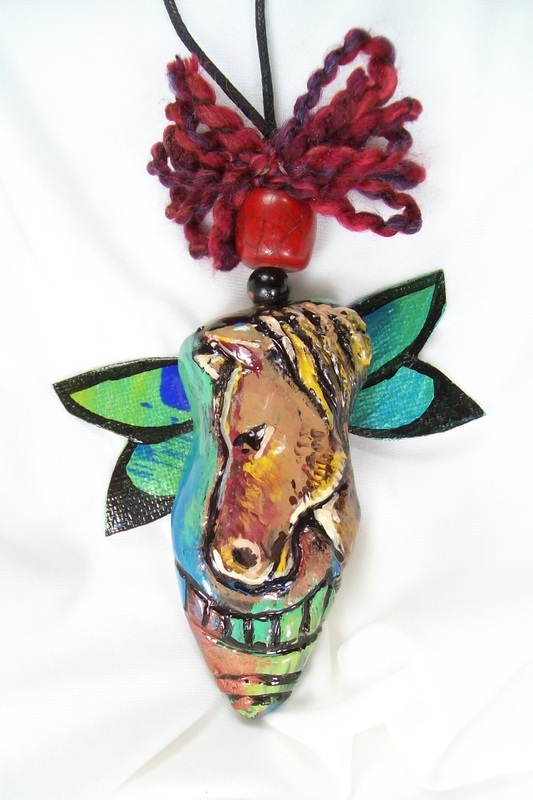 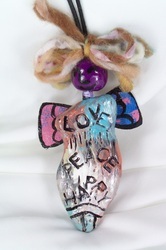 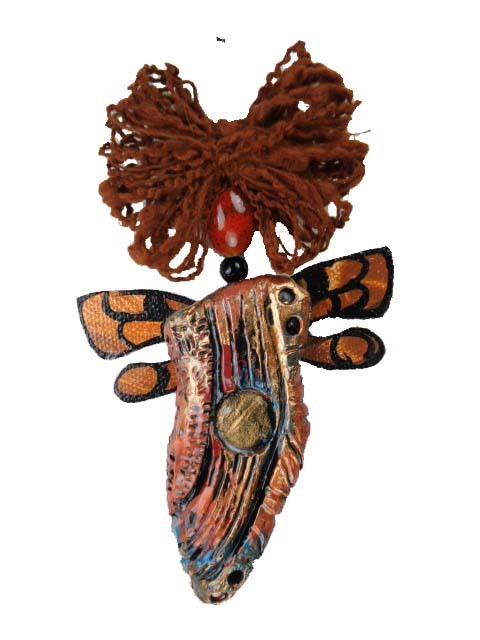 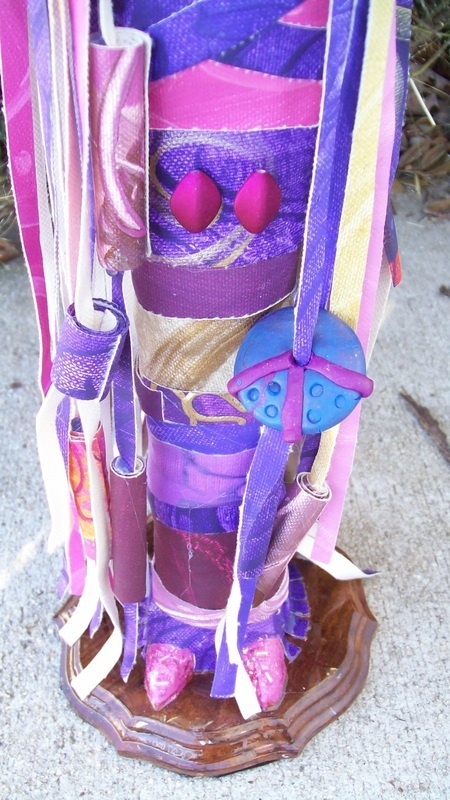 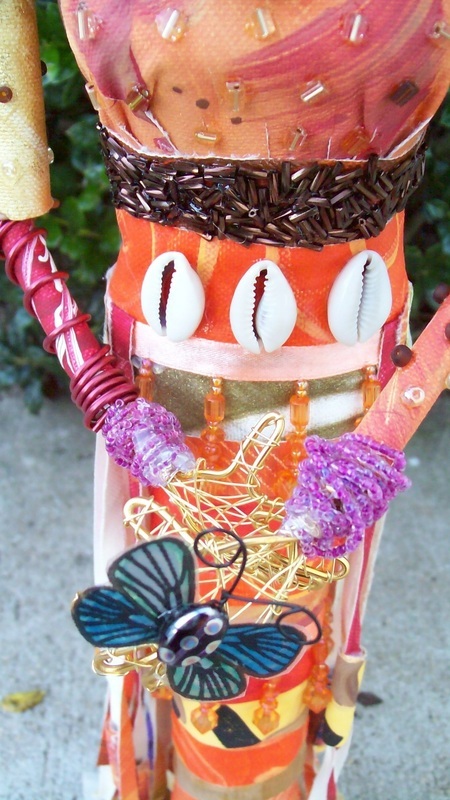 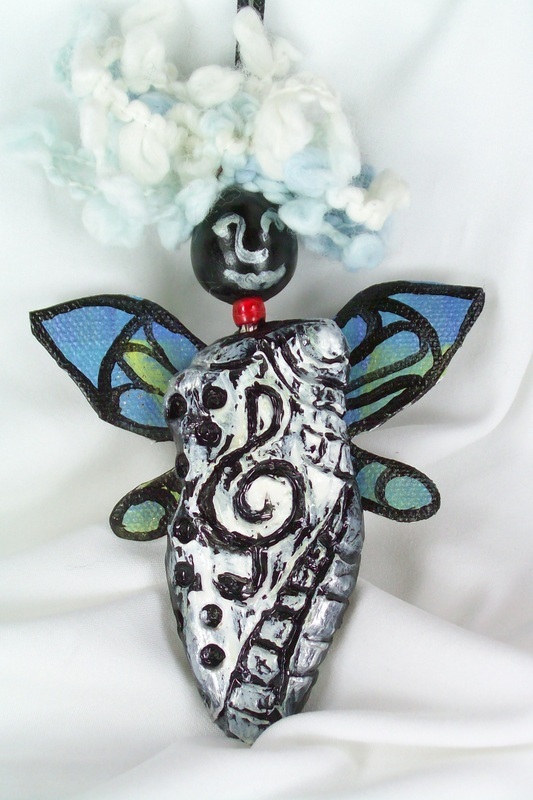 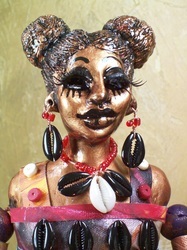 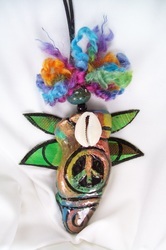 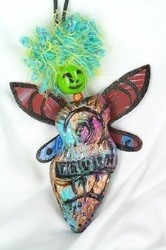 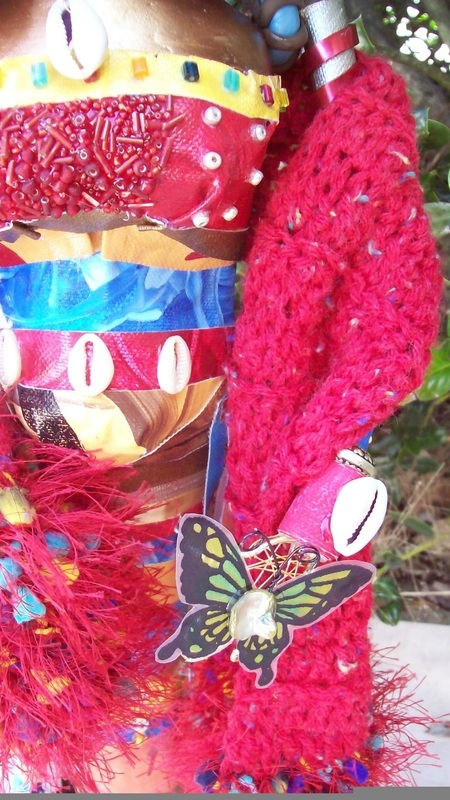 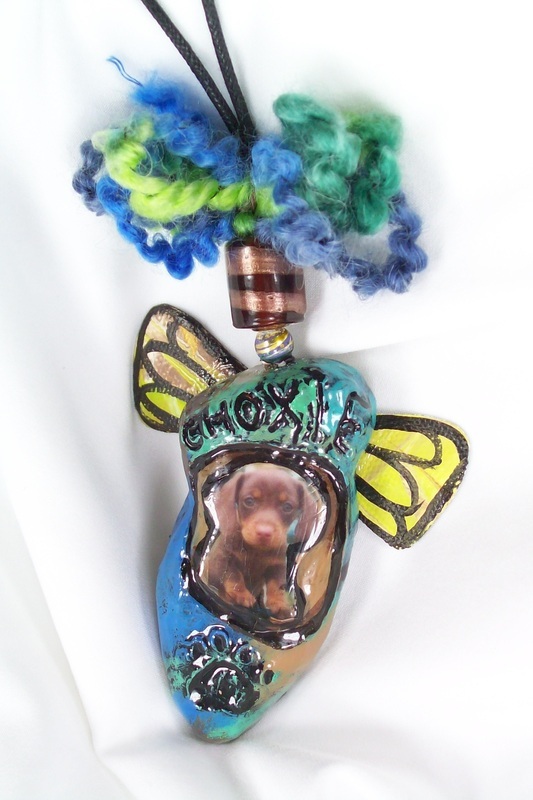 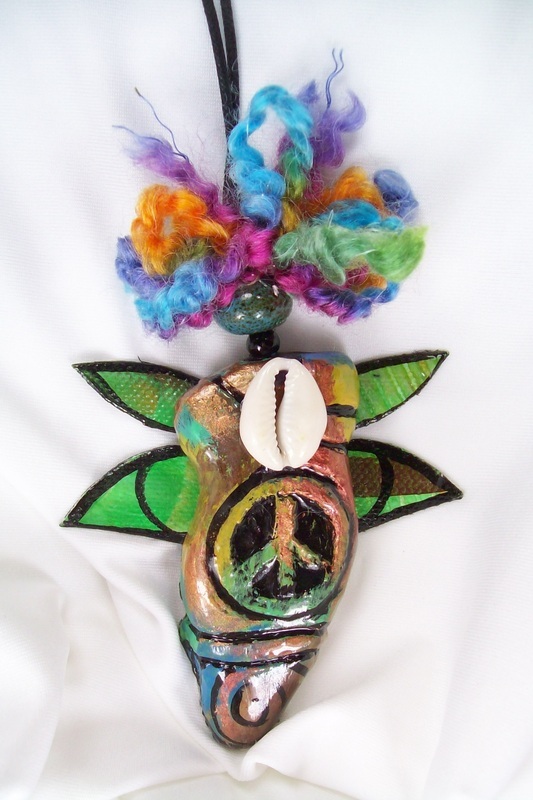 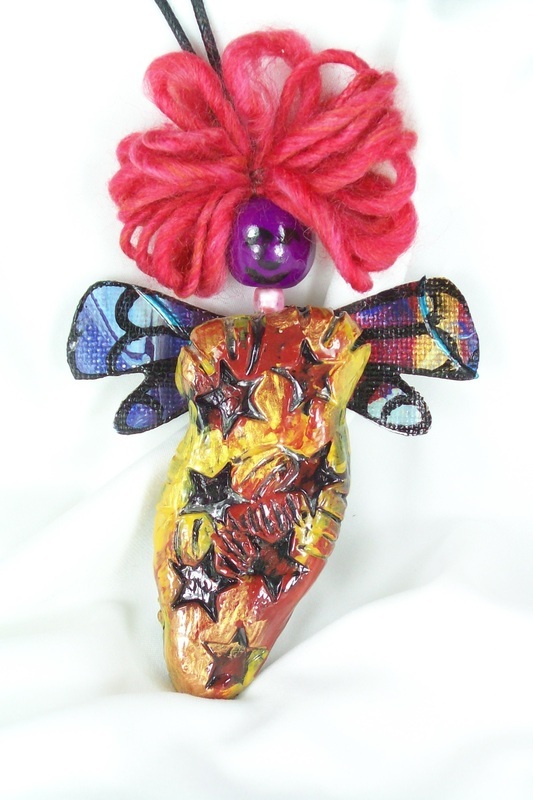 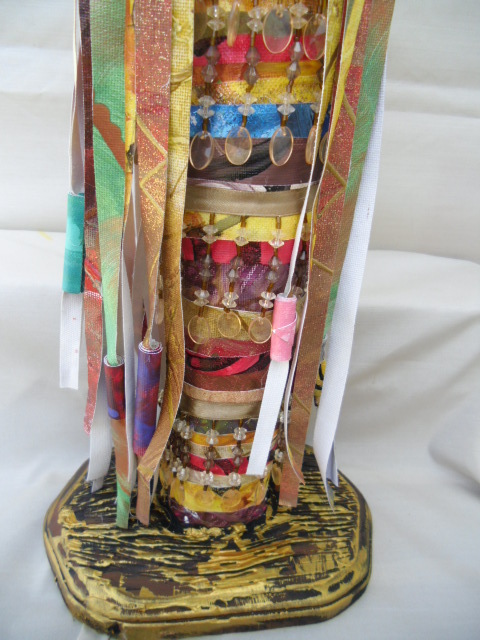 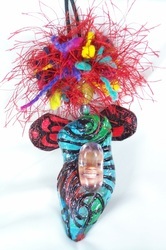 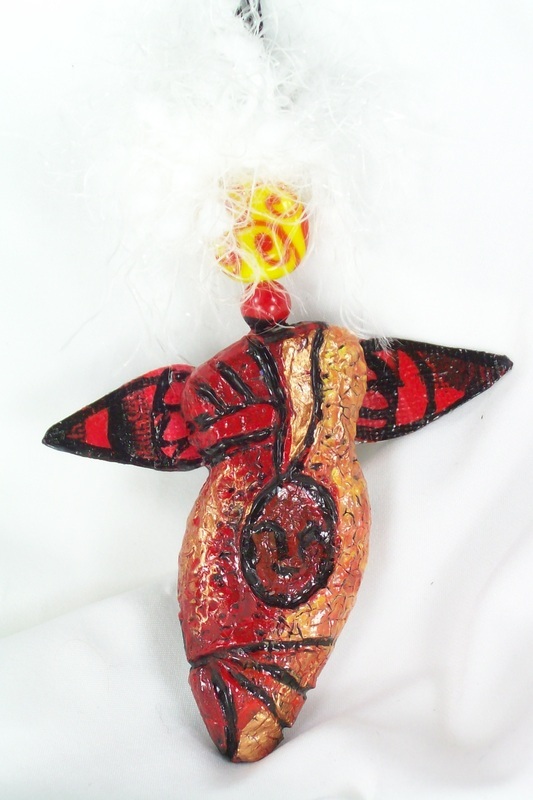 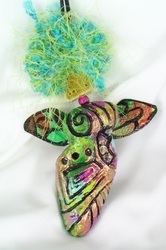 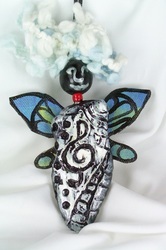 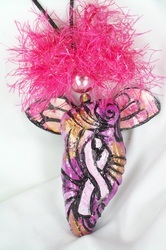 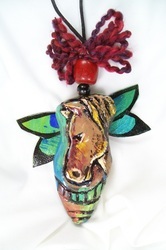 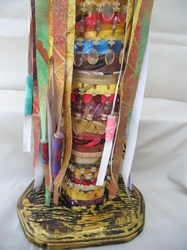 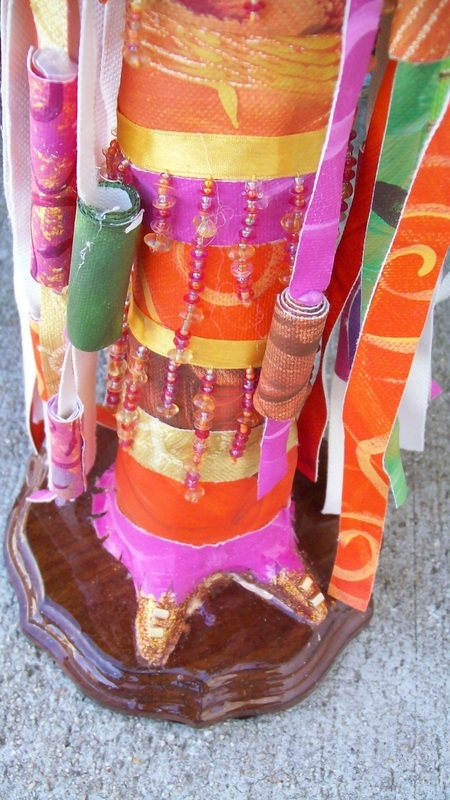 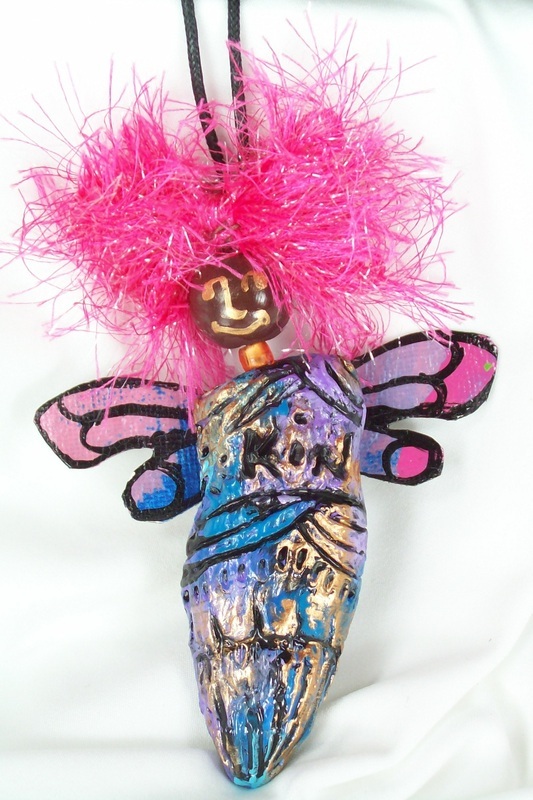 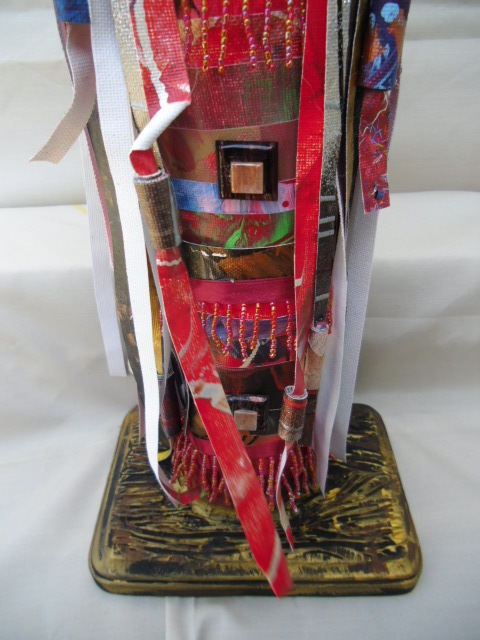 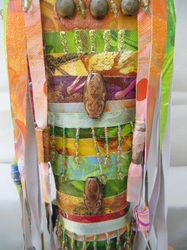 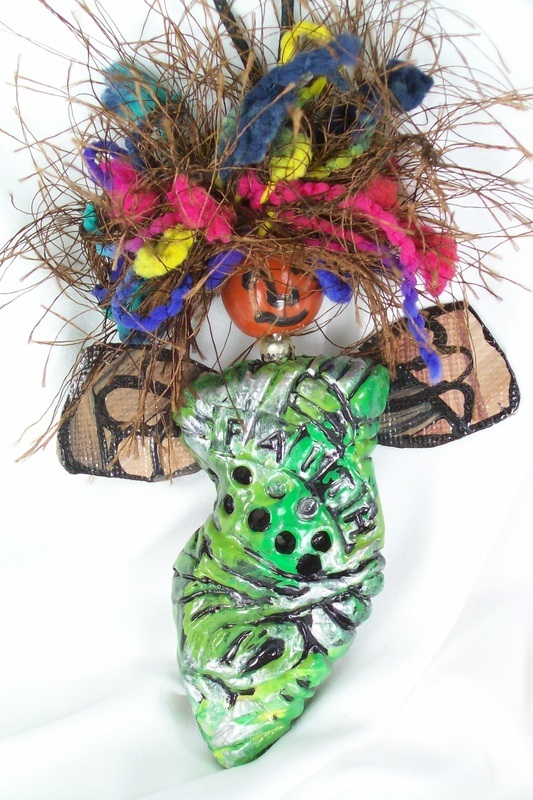 Each Chrysalis is an original, one of a kind handmade sculpture; no kits or molds are ever used. 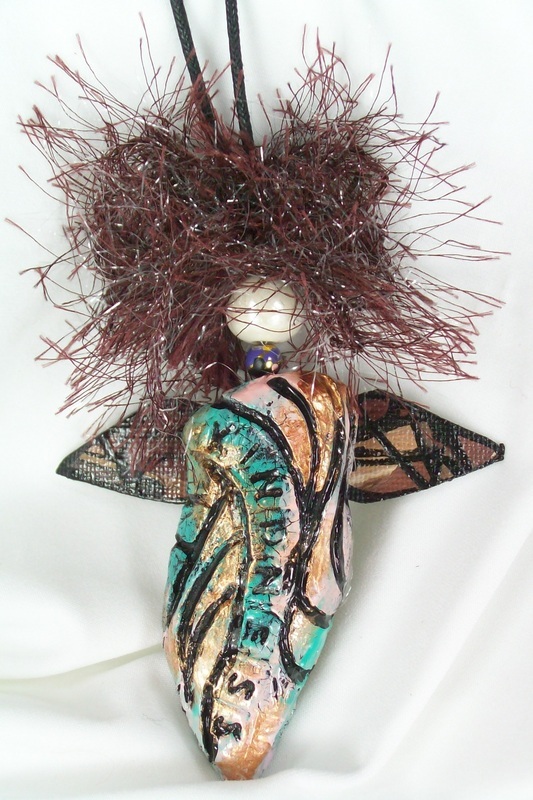 The design for the Chrysalis Series is my own from head to toe. 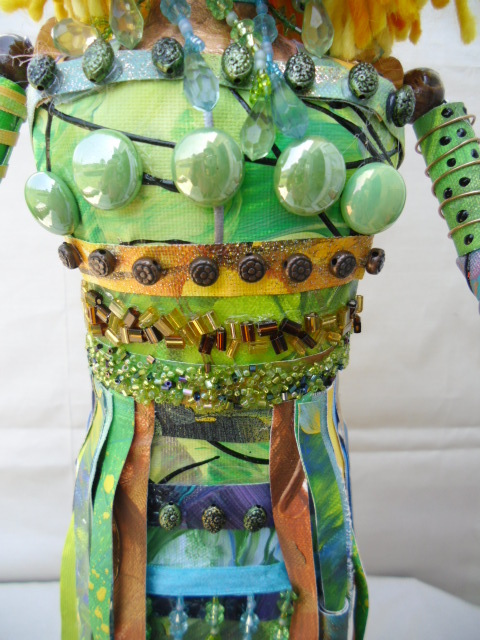 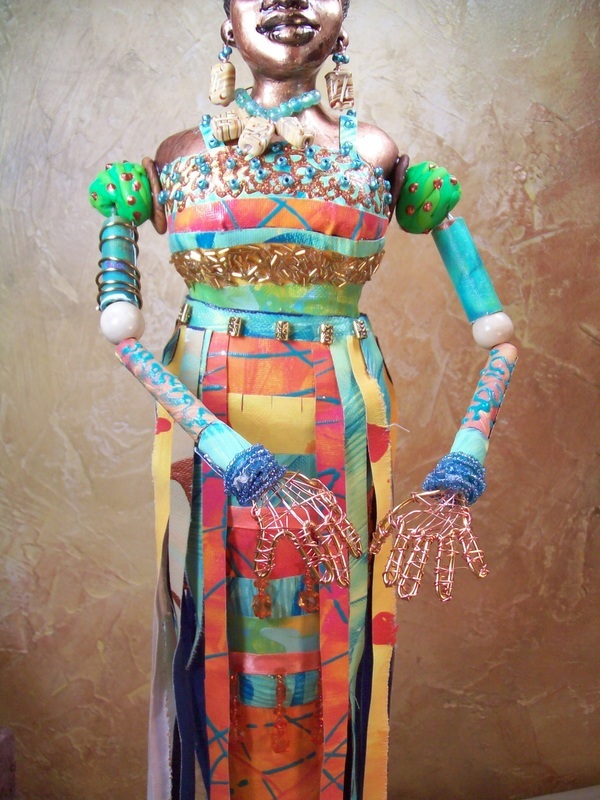 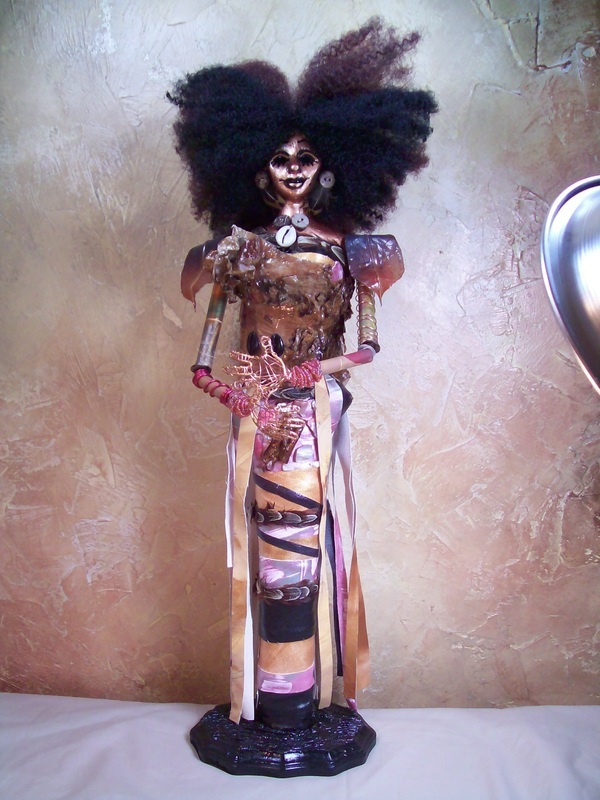 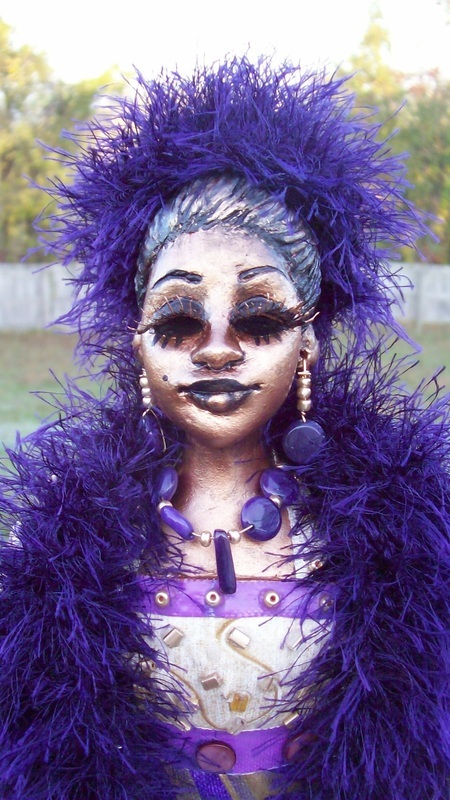 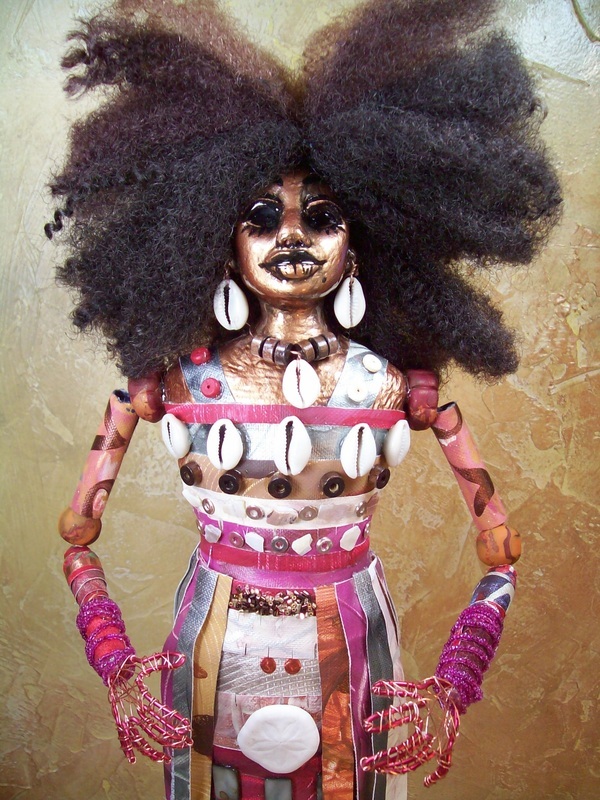 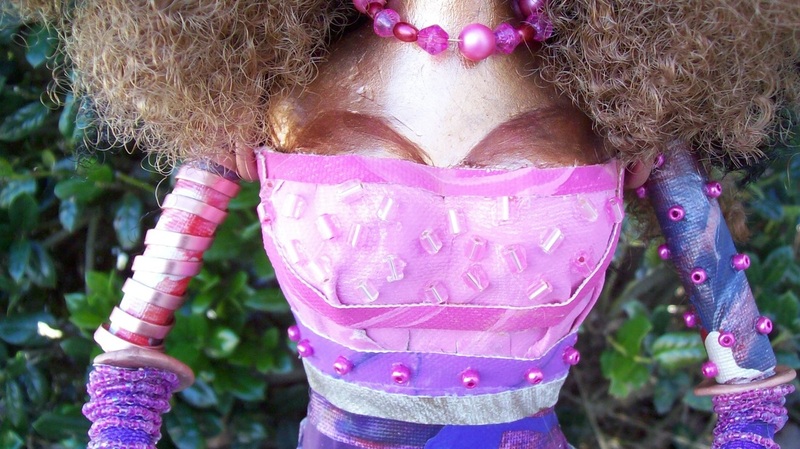 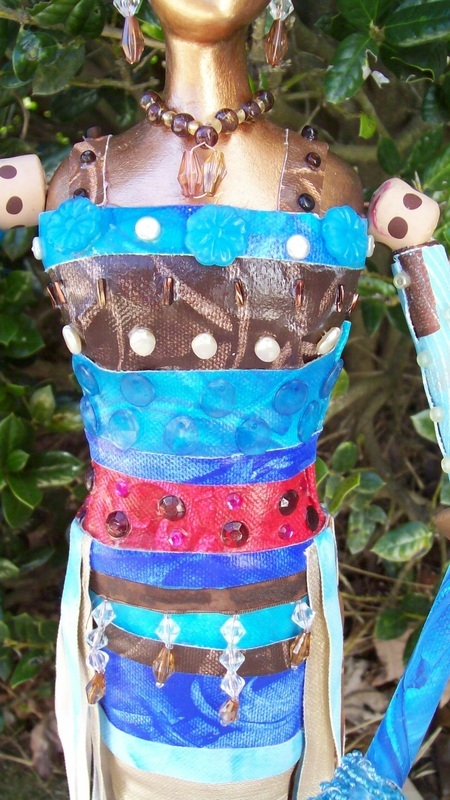 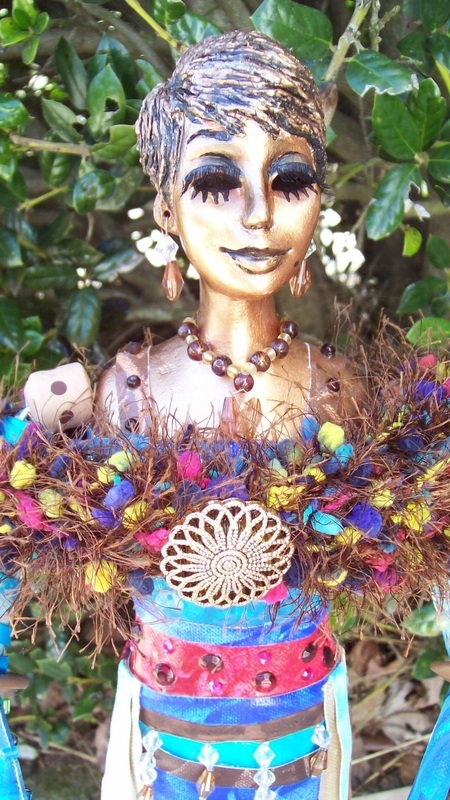 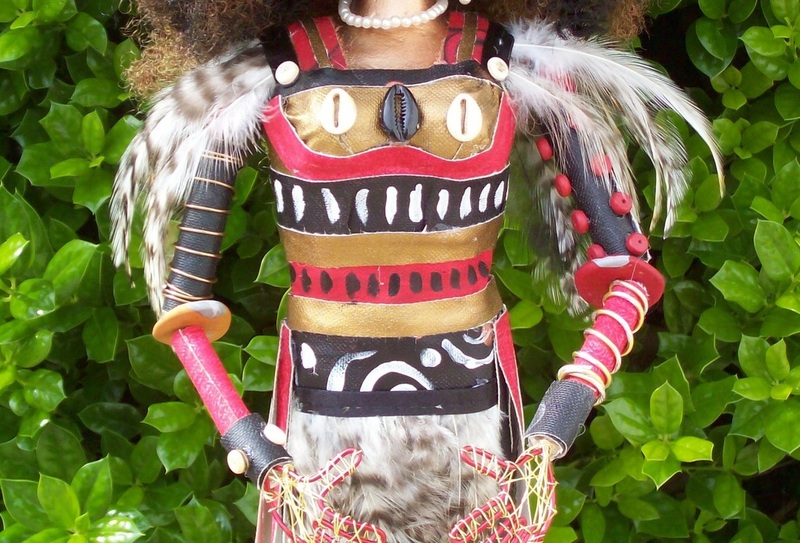 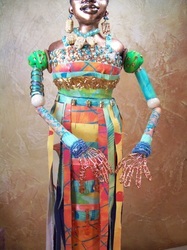 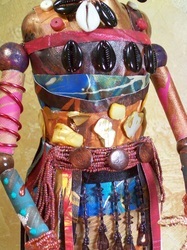 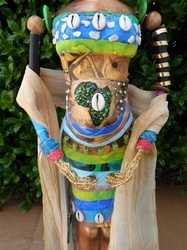 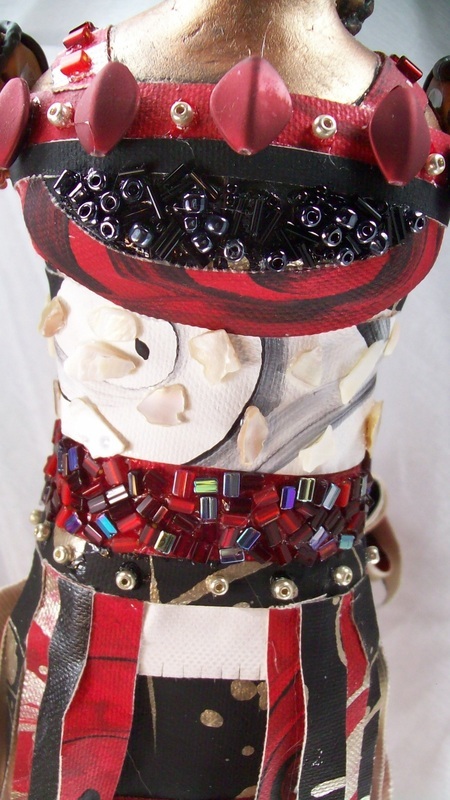 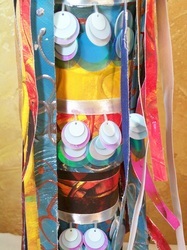 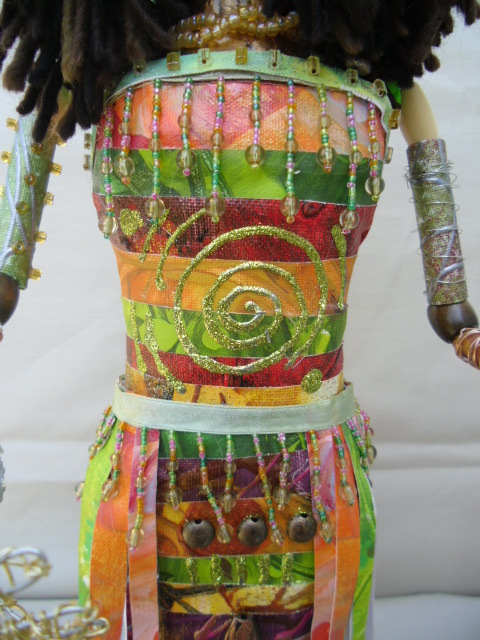 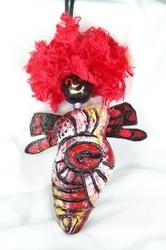 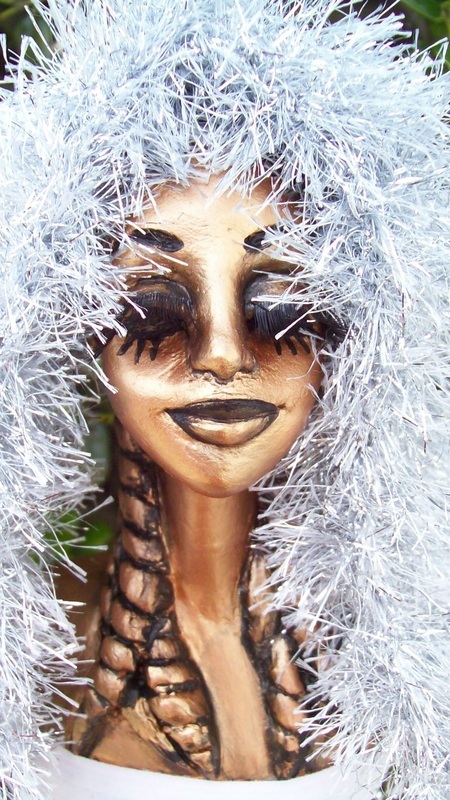 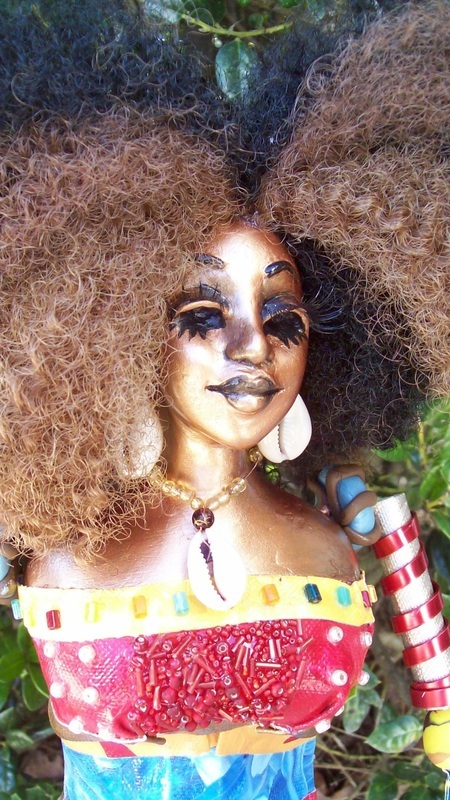 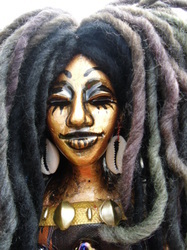 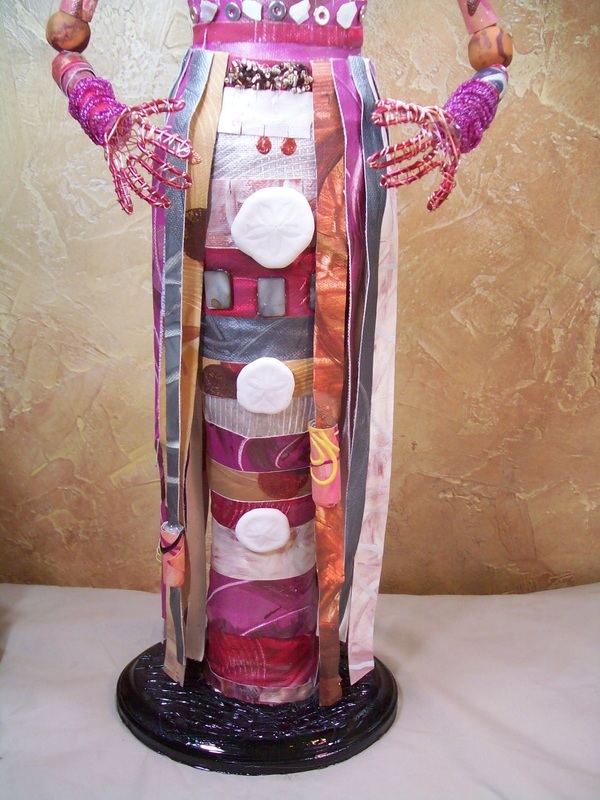 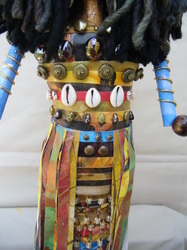 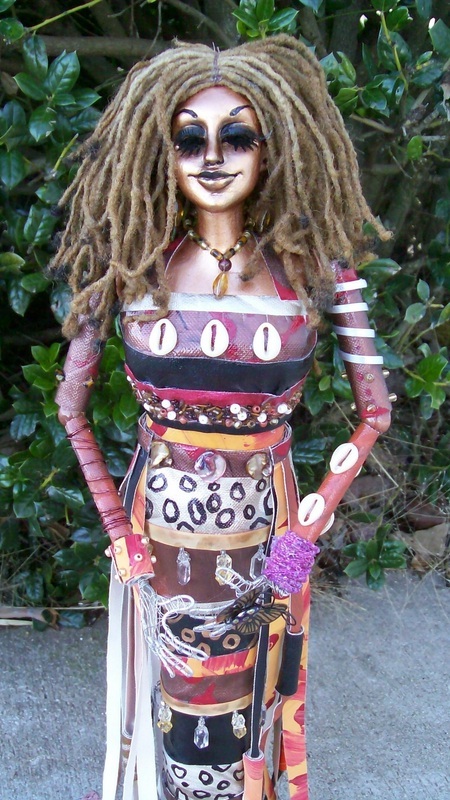 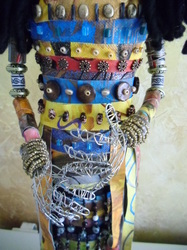 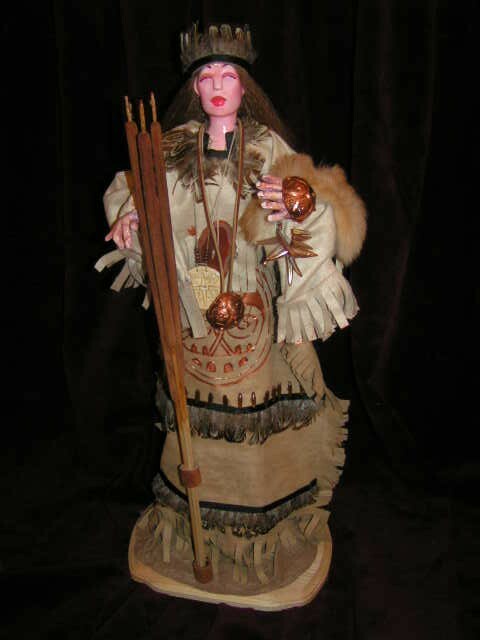 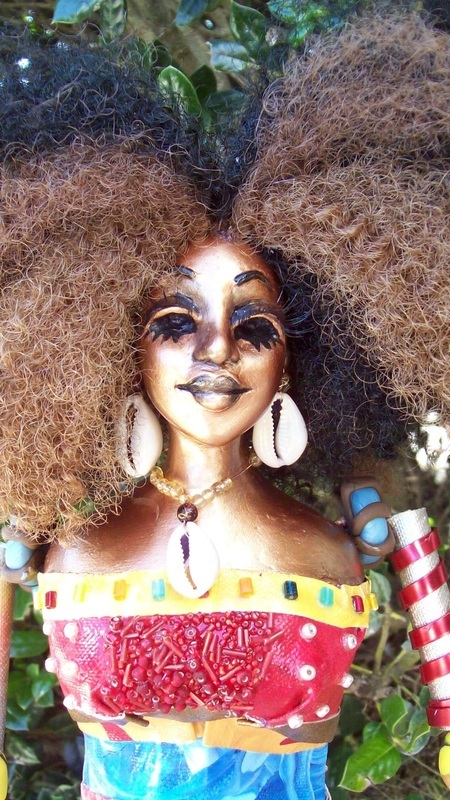 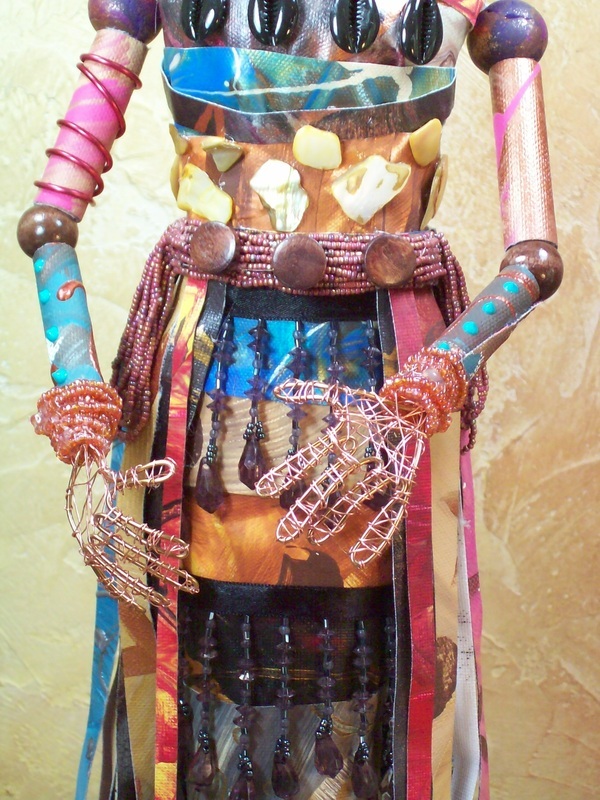 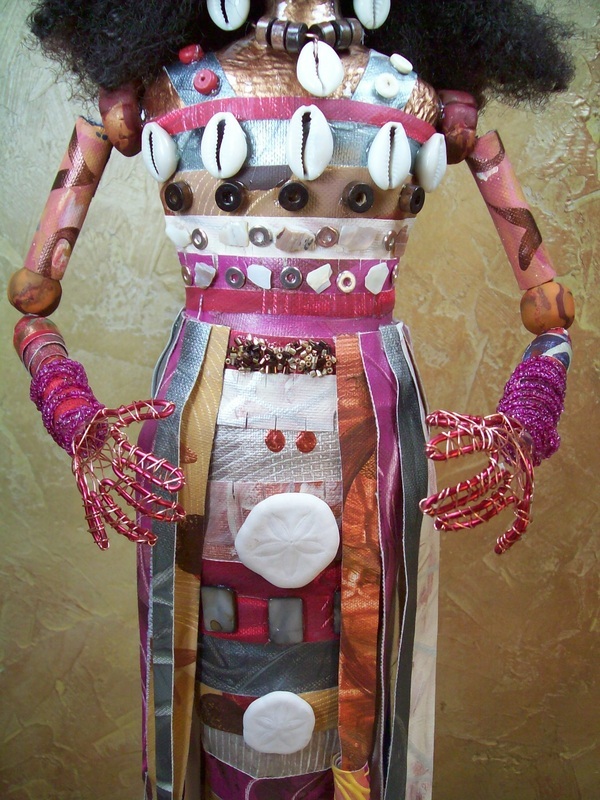 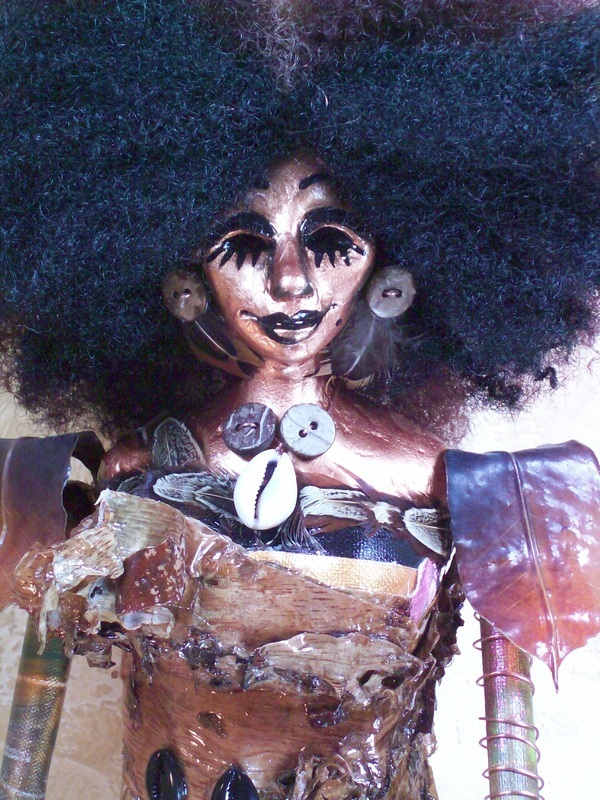 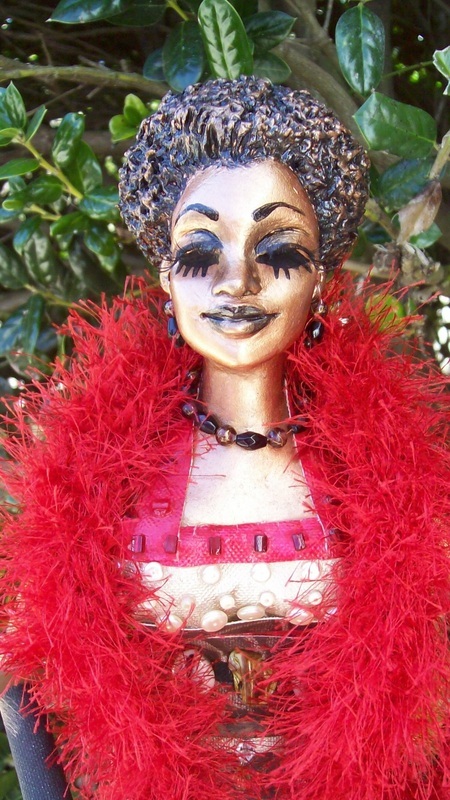 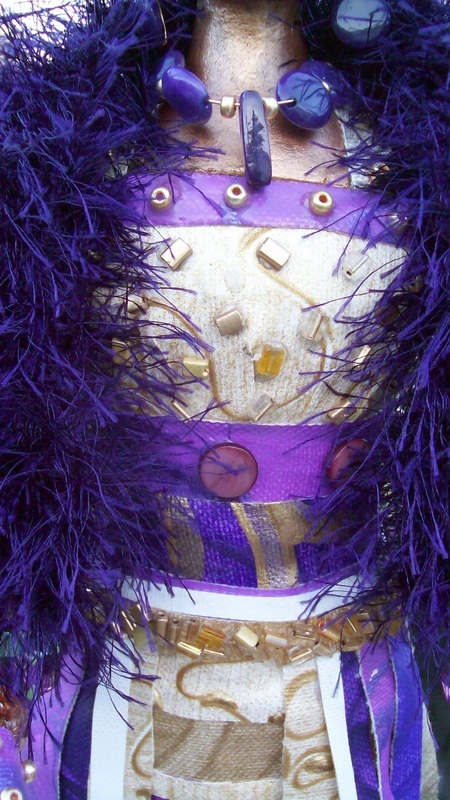 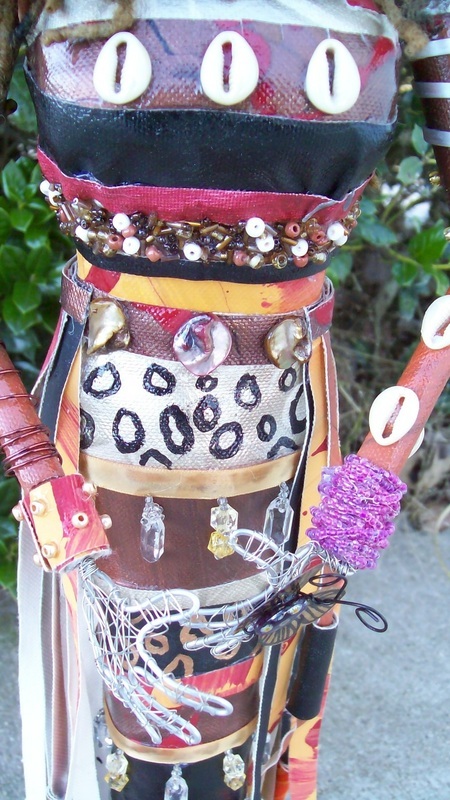 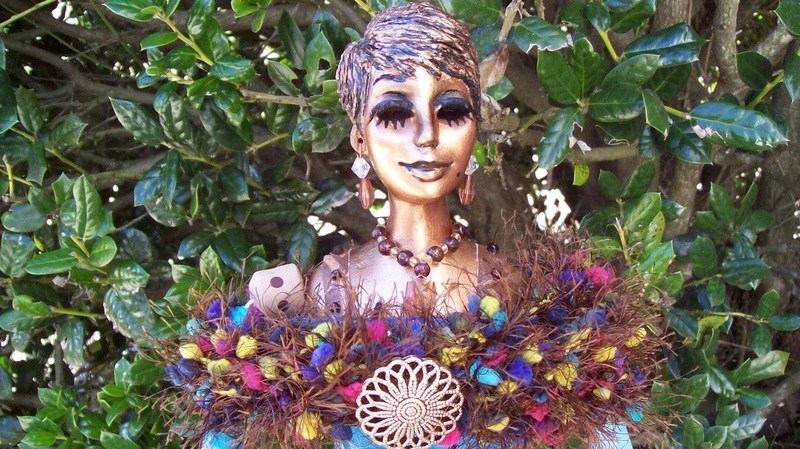 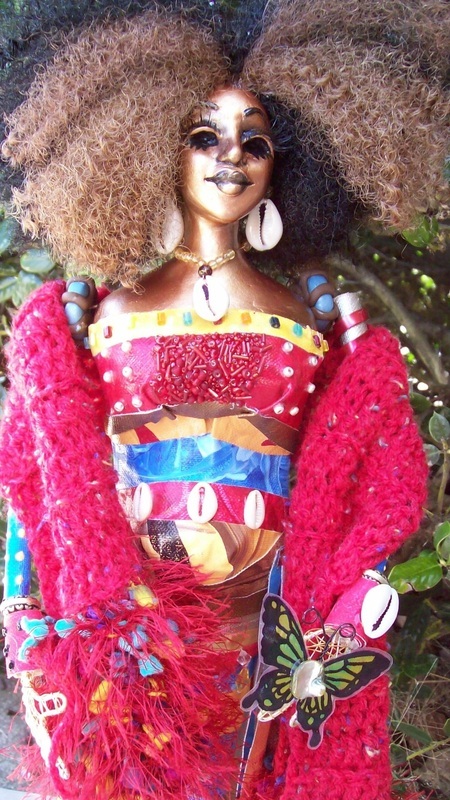 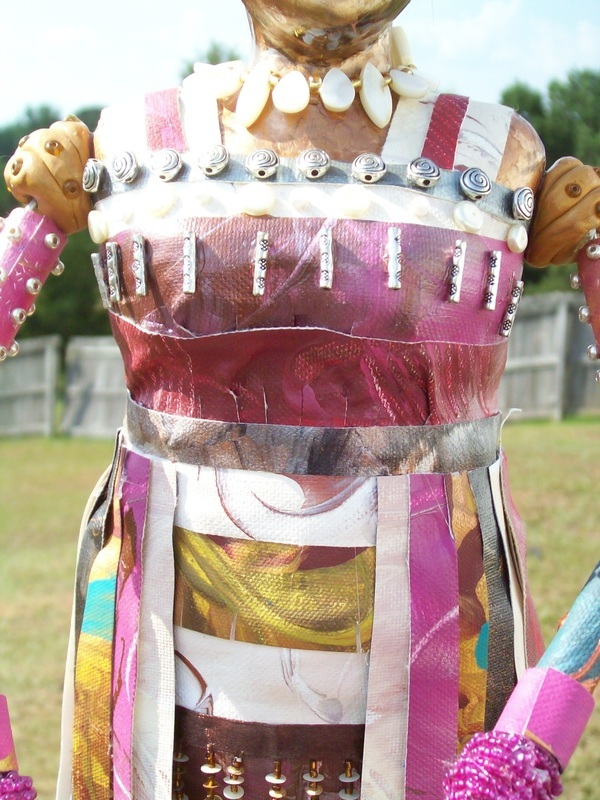 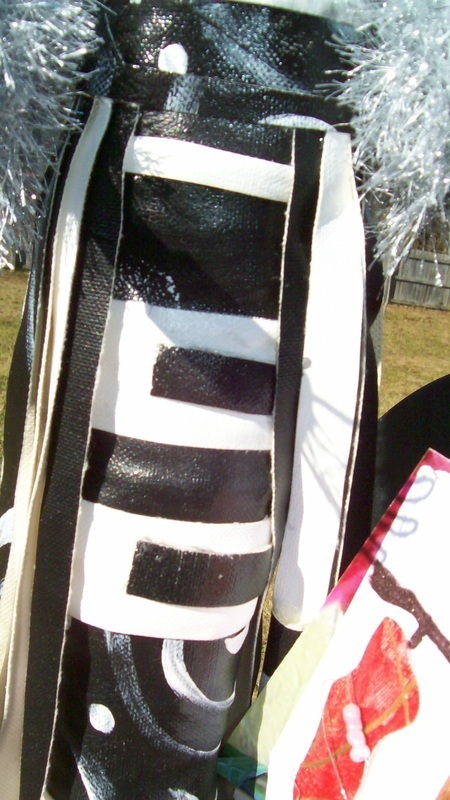 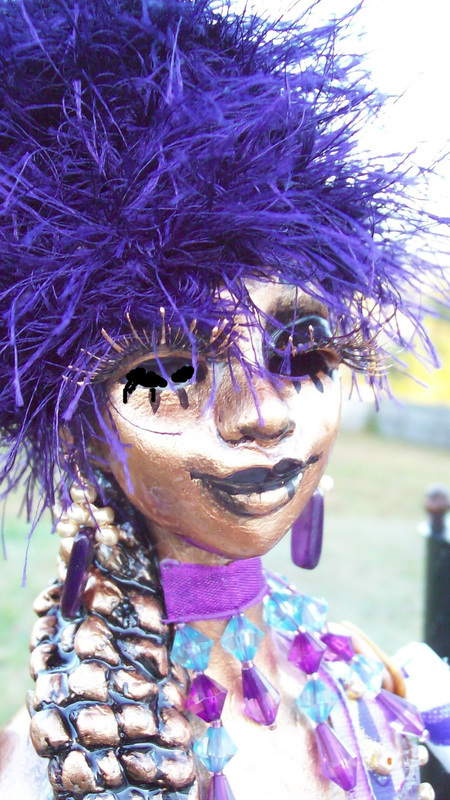 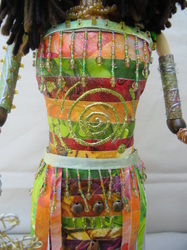 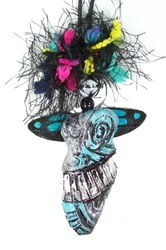 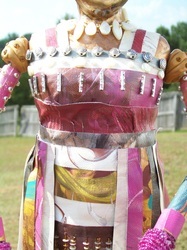 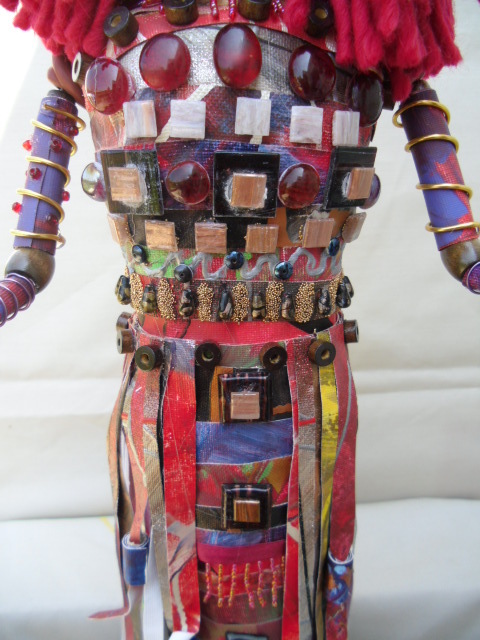 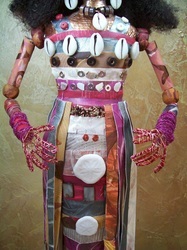 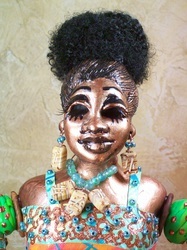 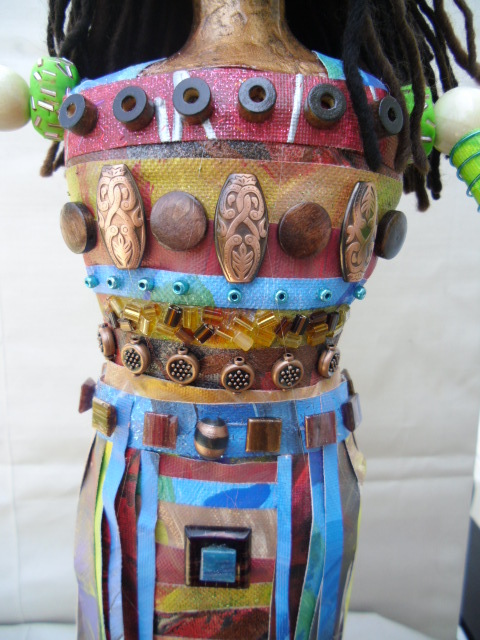 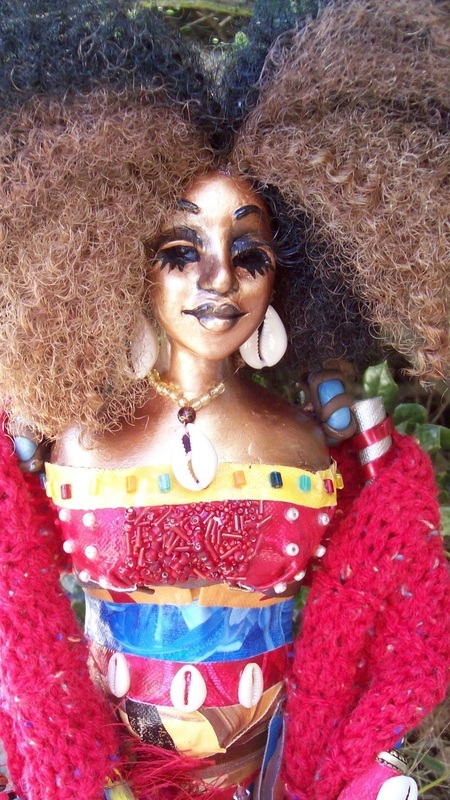 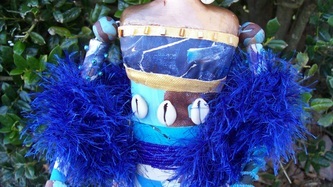 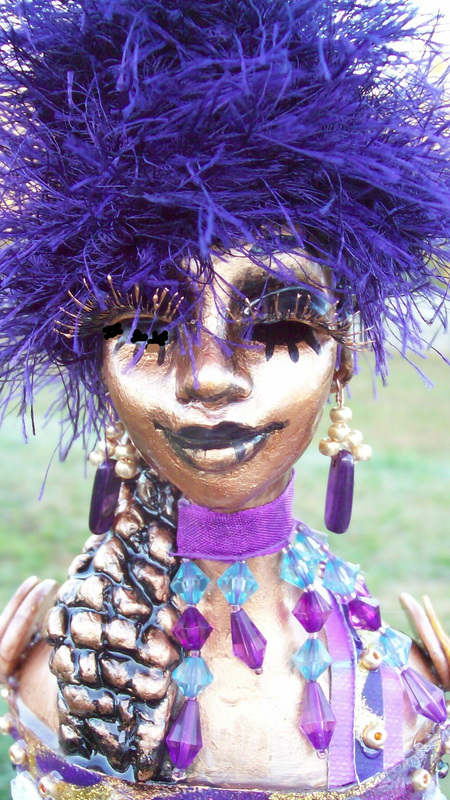 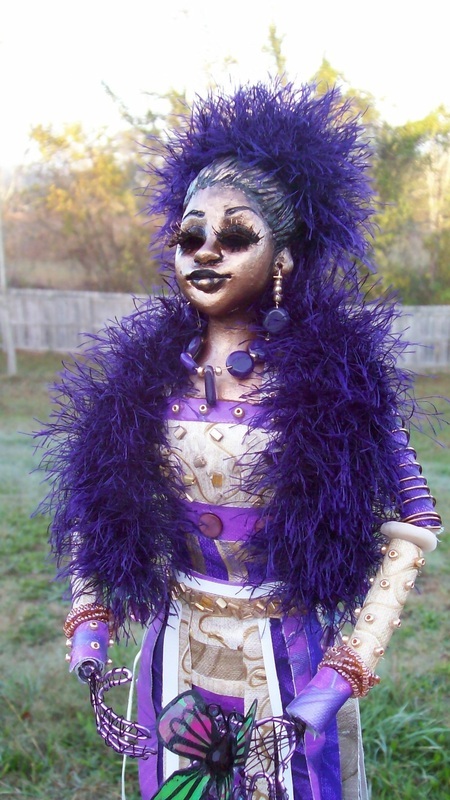 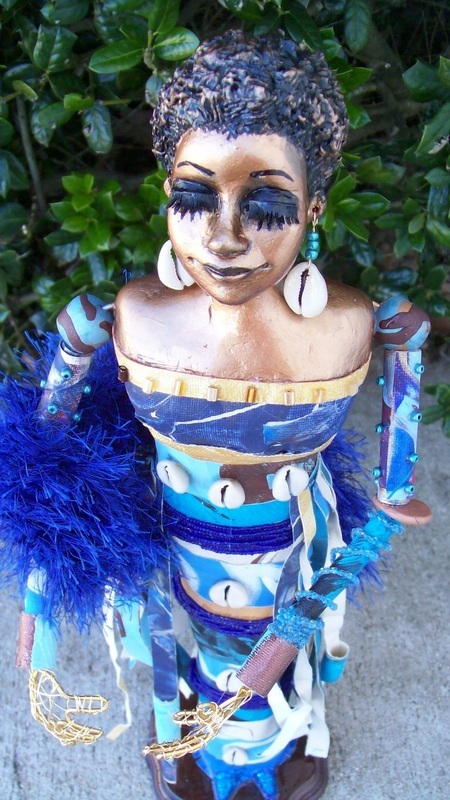 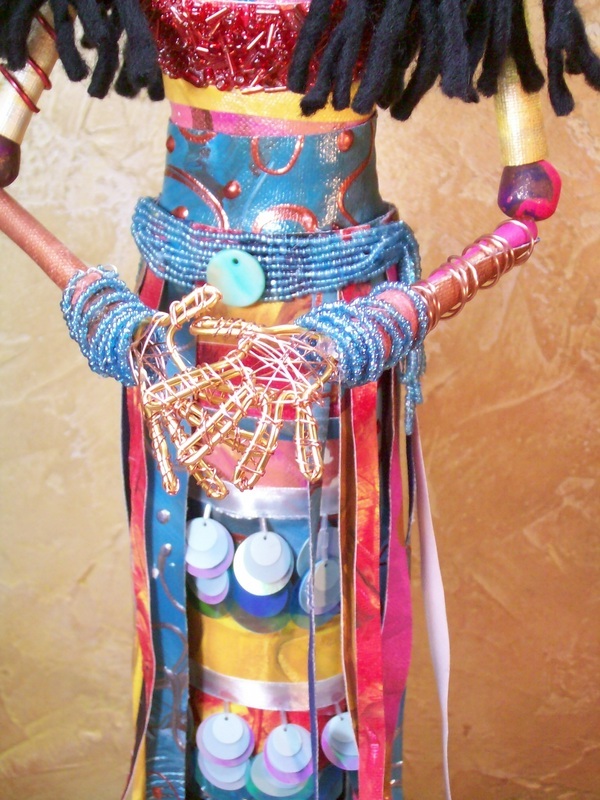 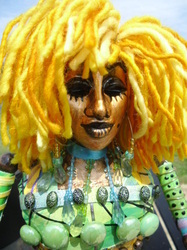 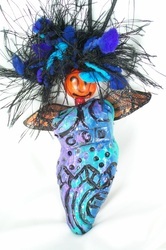 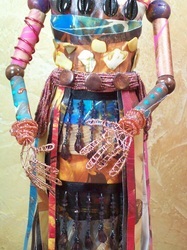 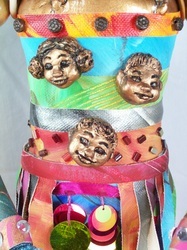 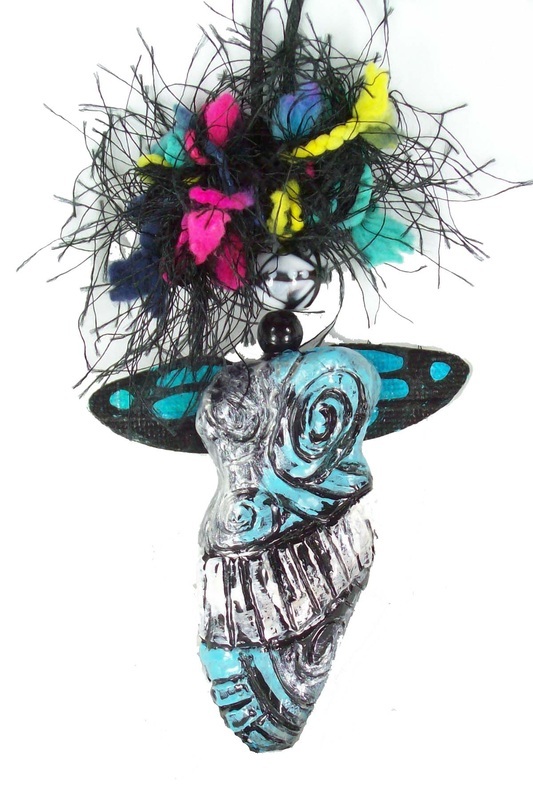 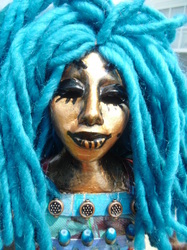 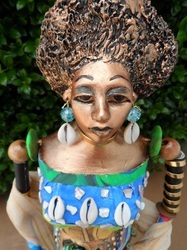 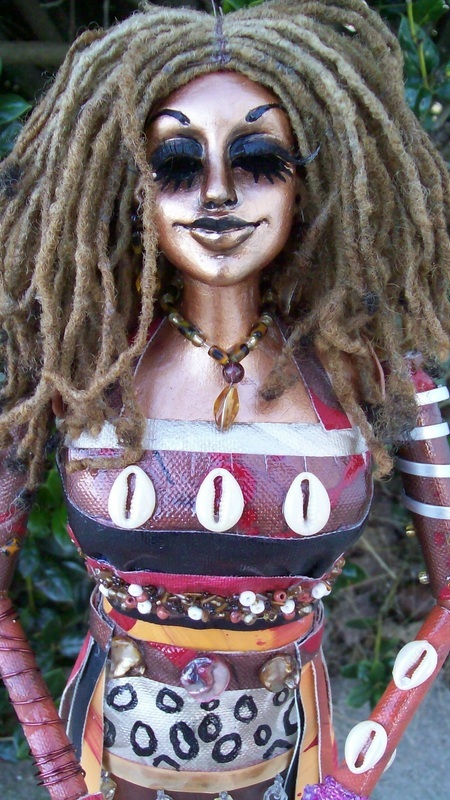 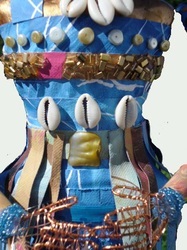 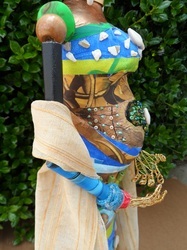 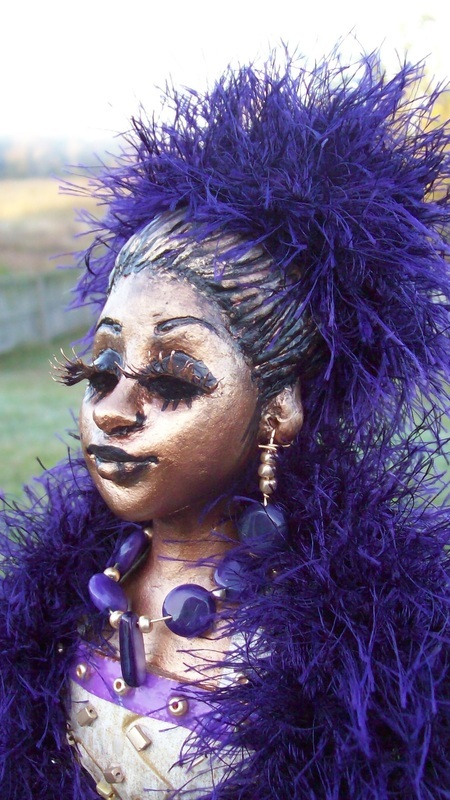 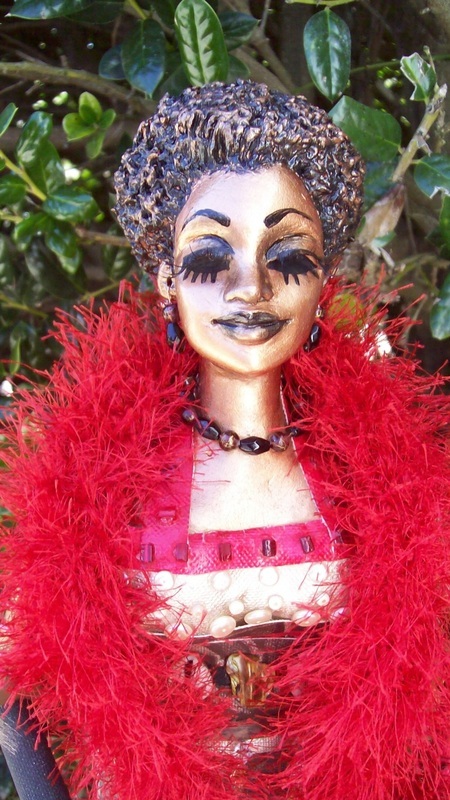 Her clothing is hand painted canvas embellished with beads, feathers, shells, wire, tiles, glitter, metallic paint and yarn. 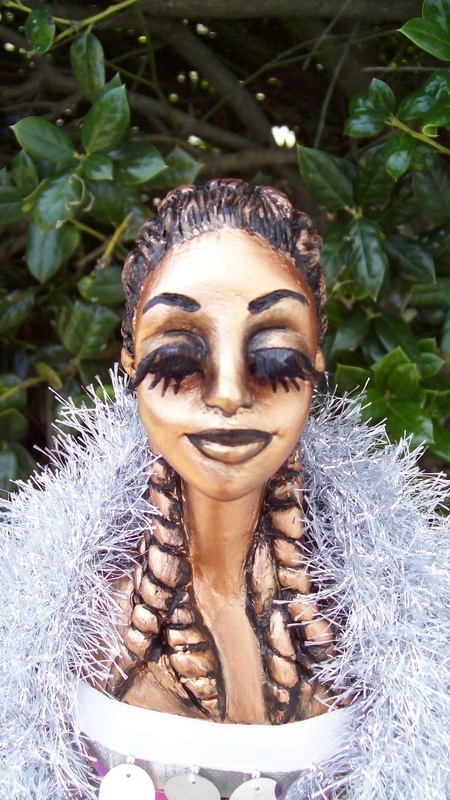 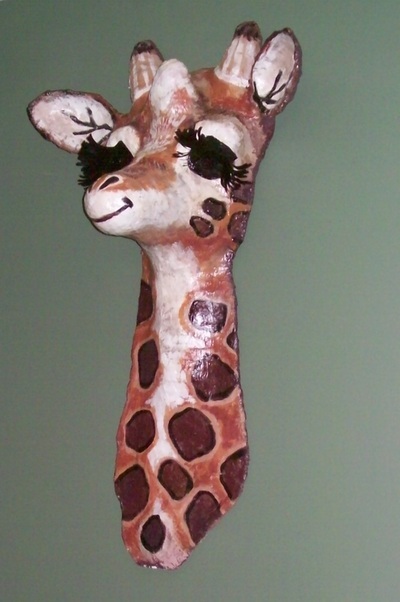 Each face is hand sculpted from a fine quality, air dry clay. 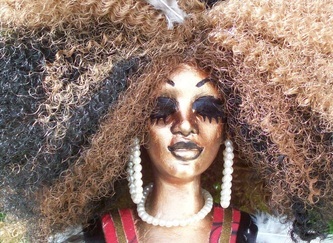 No two faces are alike. 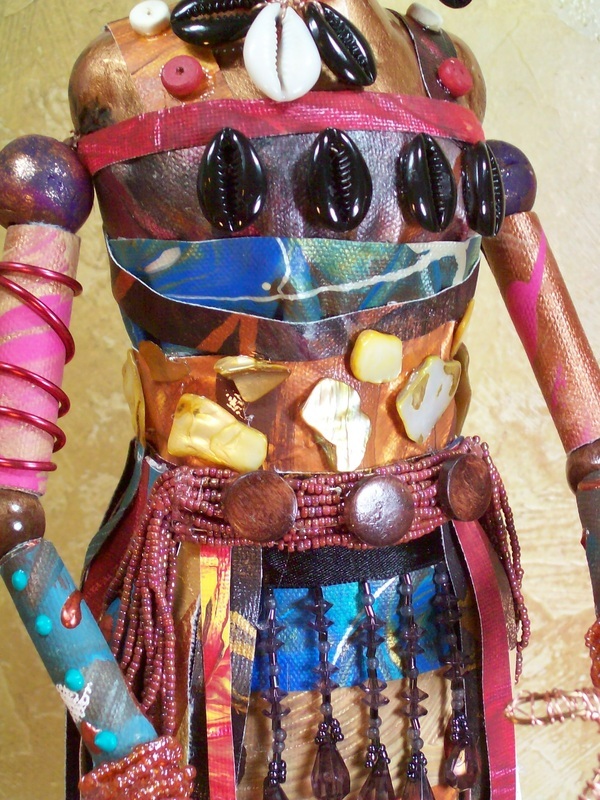 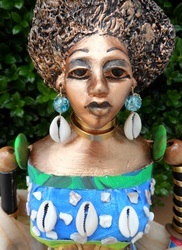 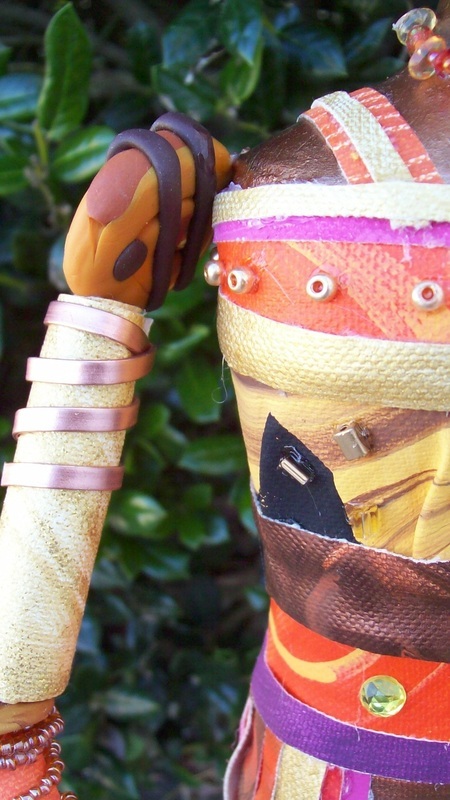 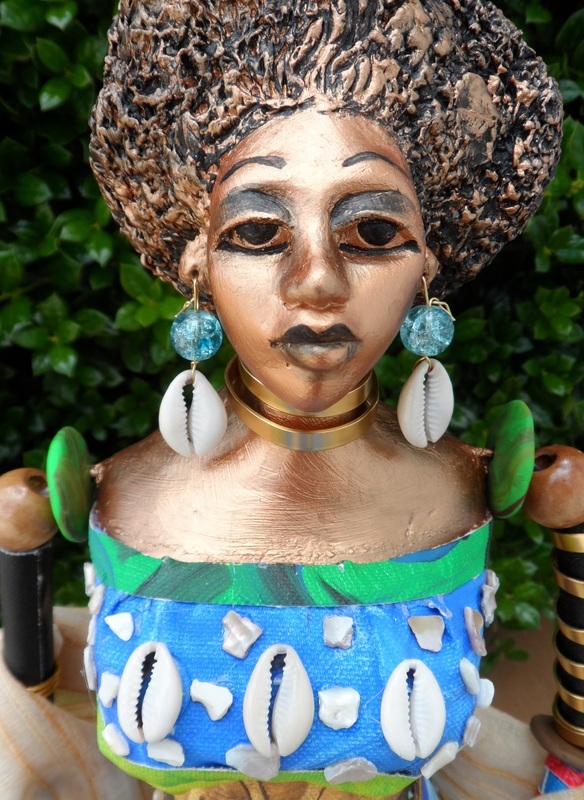 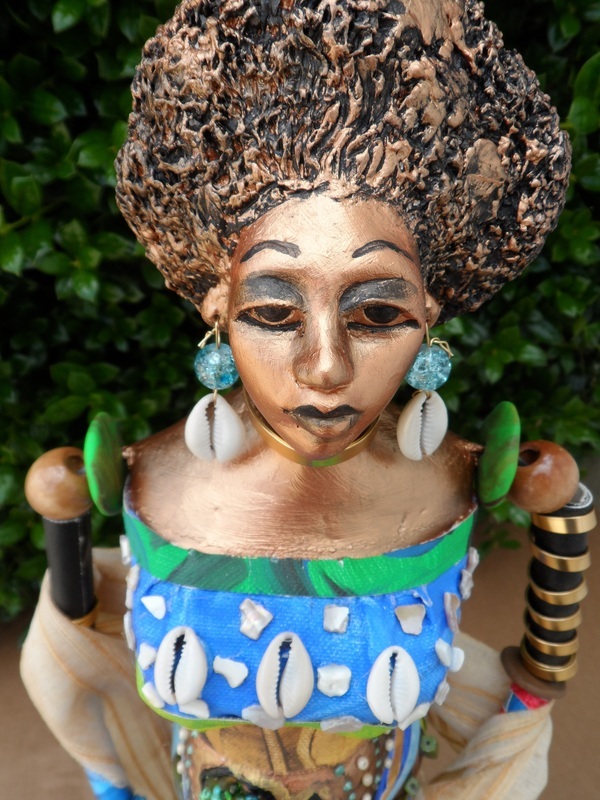 Her body is individually sculpted to embrace a variety of body shapes and is carefully layered in the hand painted canvas mentioned beforehand. 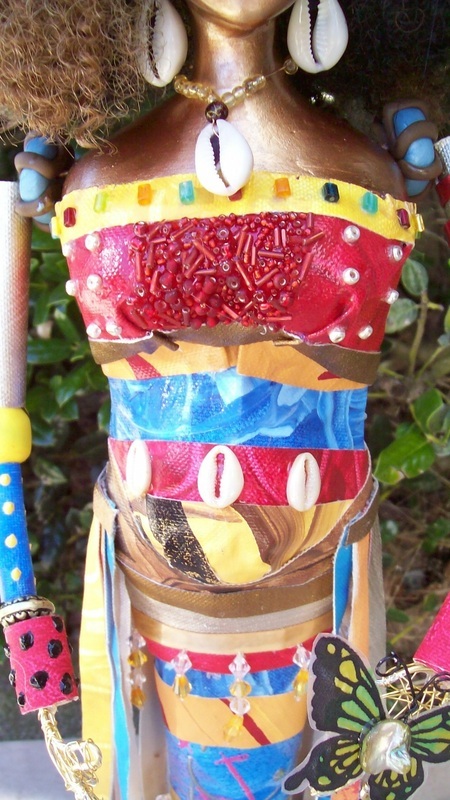 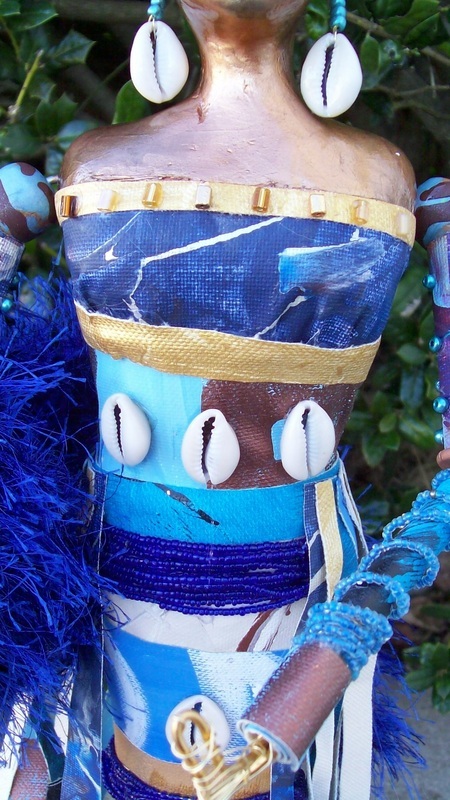 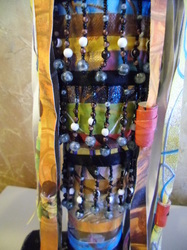 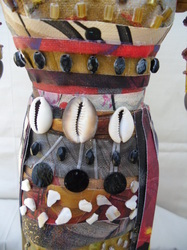 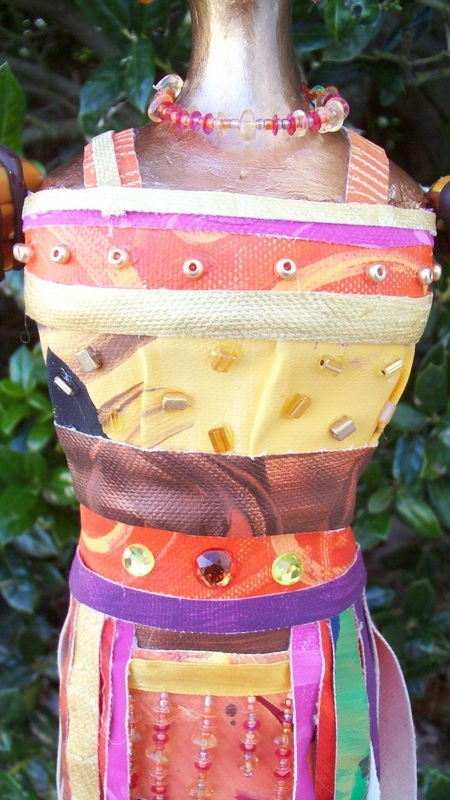 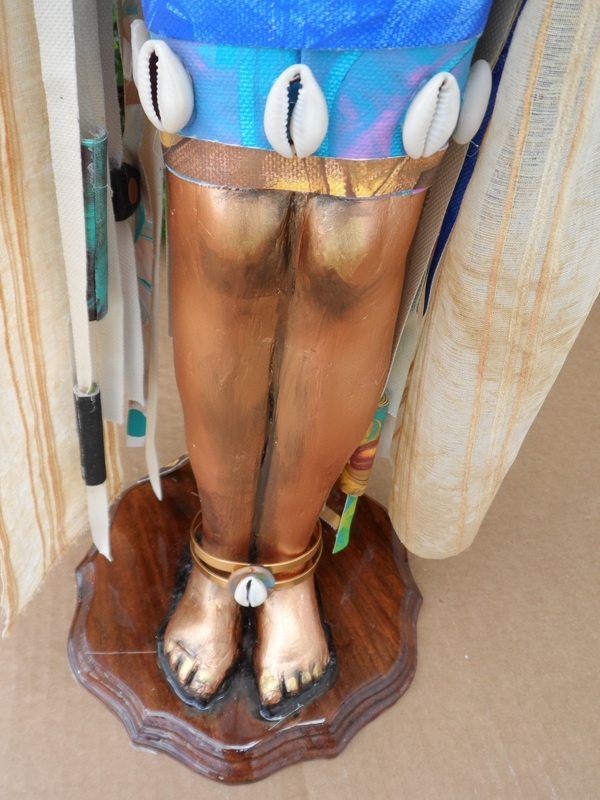 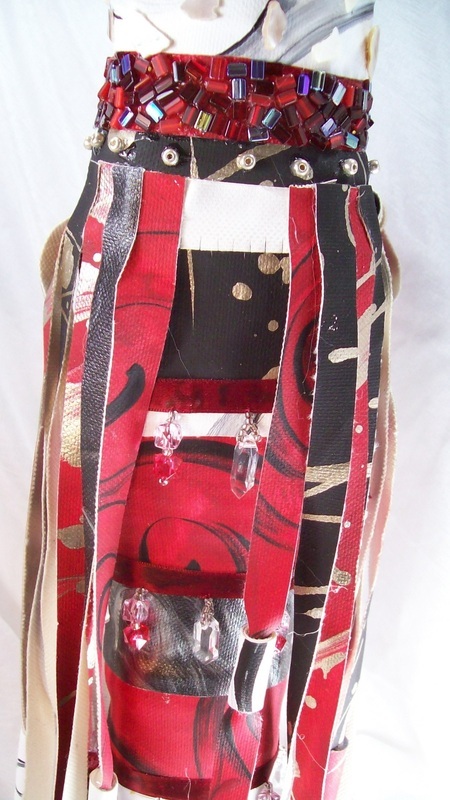 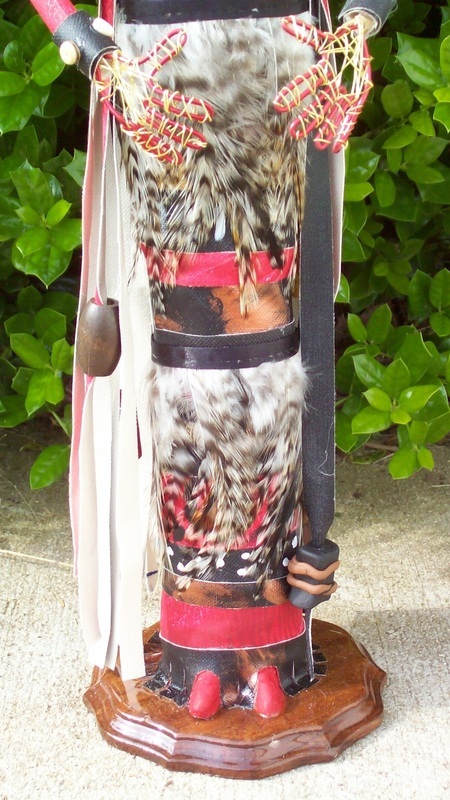 Her skirt and arm beads are also constructed from this same hand painted canvas. 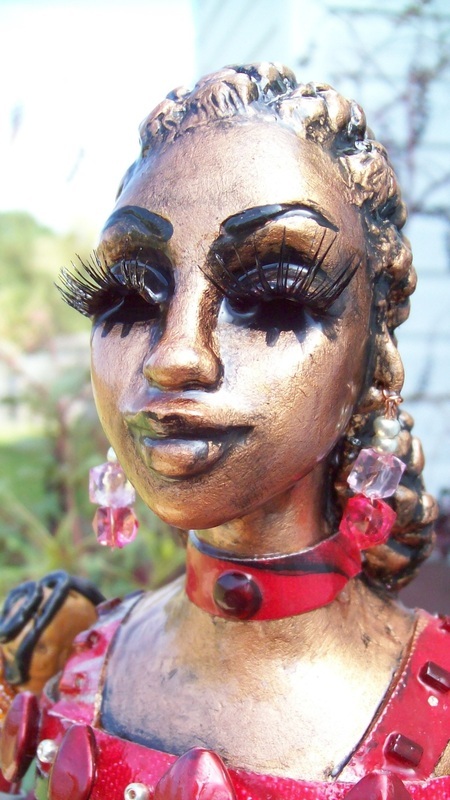 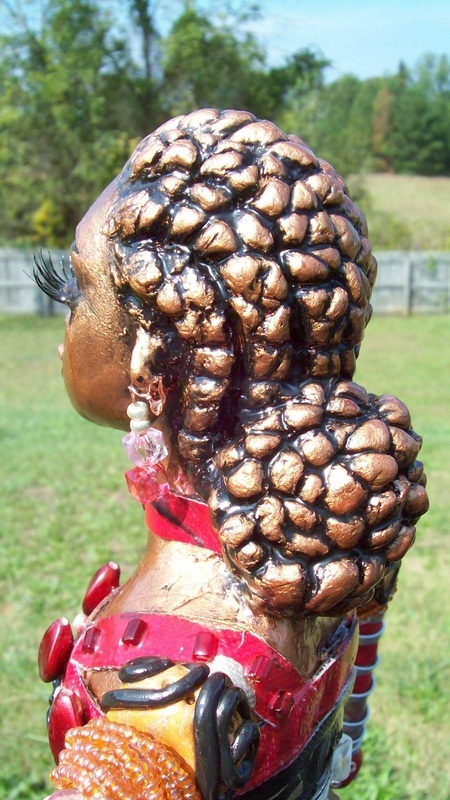 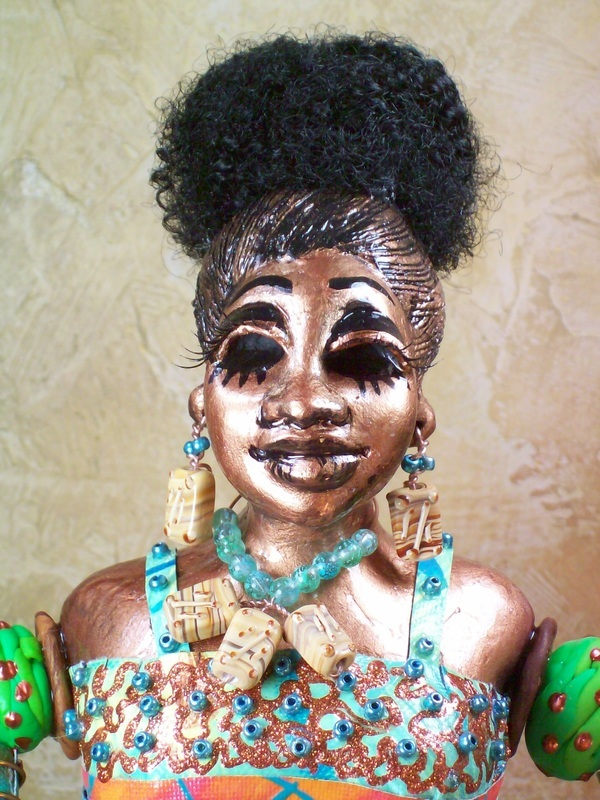 She's a uniquely detailed, completely handcrafted piece of artwork, just as we all are, created for the 'sage-seasoned' woman. 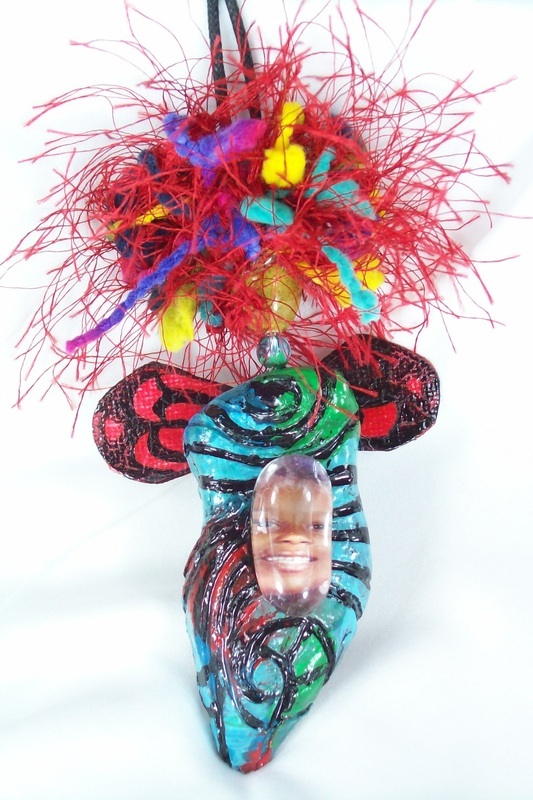 Your Chrysalis can be customized to accommodate any color, affiliation, life experience, celebration, style or personality request. 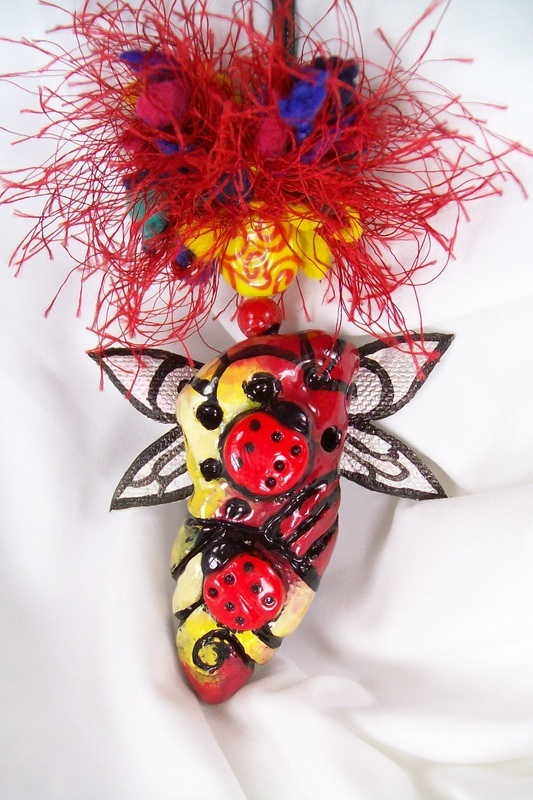 Splatterbugz are approximately 3.5 inches long, 1.25 inches wide with a 2.5 inch wing span and 3/8 inch thick. 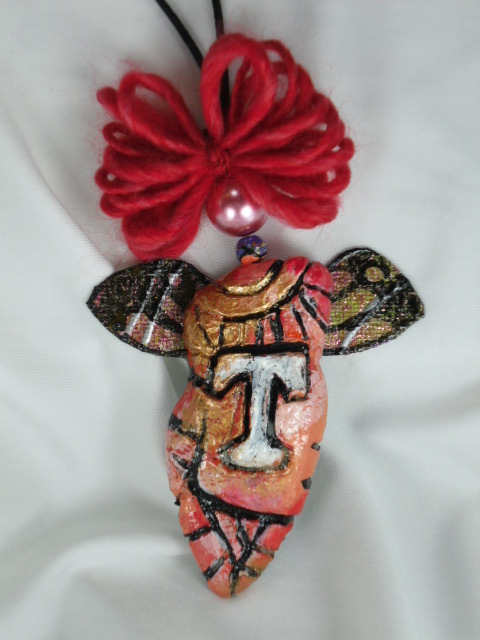 These miniature sculptures are hand formed from air dry clay, embossed, and painted with great attention to detail and craftsmanship. 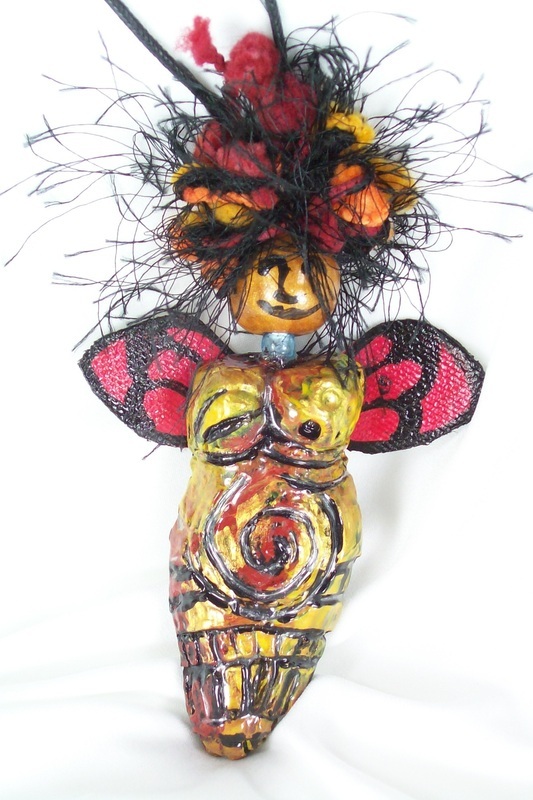 The body shape is a combination of the female figure and a butterfly chrysalis which symbolize fertility, growth and transformation. 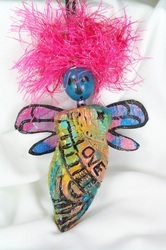 They are available as brooches, magnets and necklaces. 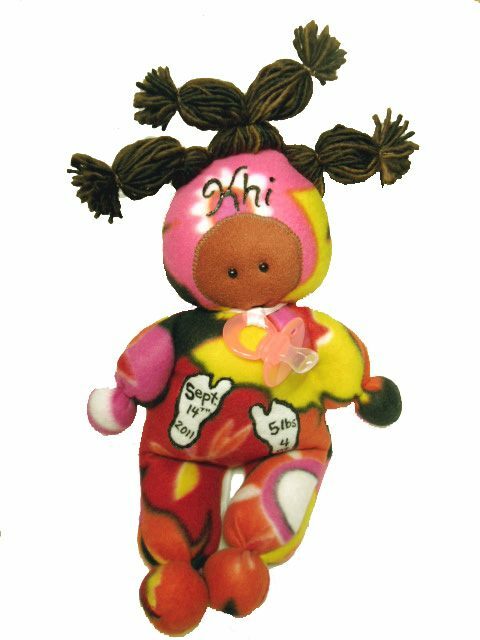 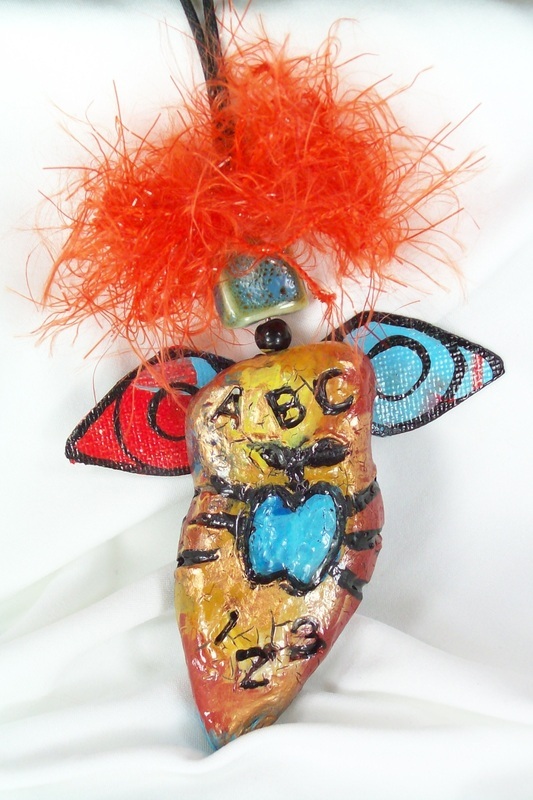 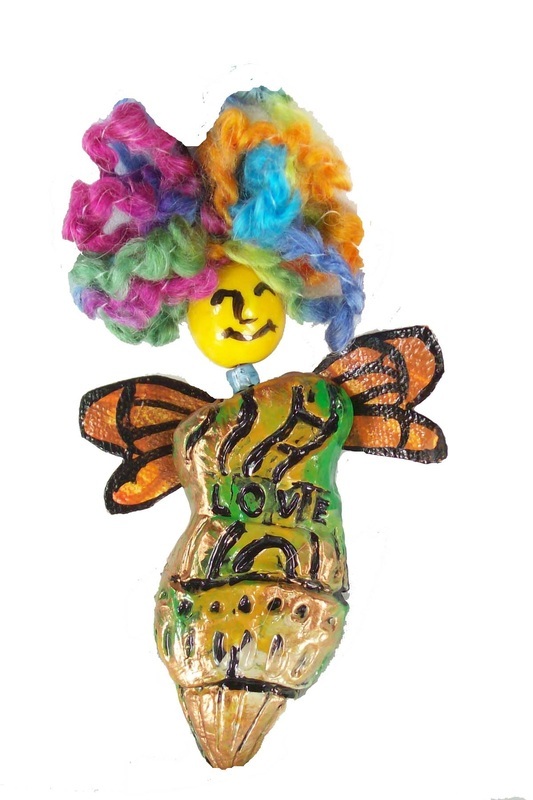 They are versatile and can be easily customized to represent any hobby, occupation, holiday, scripture/quote, zodiac sign, group affiliation, sport, animal or cause... whatever is important to your SplatterBug! 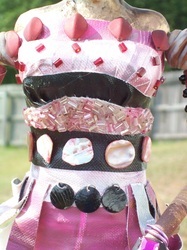 Photos can even be added. They are accompanied by the SplatterBugz story and a card from the giver to explain why they consider the recipient to be a SplatterBug.